In case you aren’t keeping up with the weather in the Bay Area, it’s been raining. And that means two important things. The first – our aquafers are being replenished. And second – snow in Tahoe! In honor of all that fresh powder, we’re showcasing a new development in Lake Tahoe called The Palisades at Squaw that puts a fresh spin on mountain chic. With the goal of being “geared for the modern mountain enthusiast,” these homes offer the weekend getaway of owning a mountain home without as much upkeep and worry about the snow getting too heavy for the roof. “We had a clear sense of which design elements we wanted to splurge on for this demographic, and we prioritized elements like beautiful but durable surface material, ample storage (both inside and out) for sports equipment, extra large beds in the bunk rooms, and of course my love of beautiful lighting for each room.” With bunk rooms that sleep four, these homes are ready for slumber parties. Take a tour of one of the homes in the slideshow! This Is SF, interviews Tineke Triggs. These sumptuous interiors will dare you to go dark. Bold, powerful and elegant, black never goes out of style. Top interior designers share some of their favorite noir projects and tips for decorating with black. Minimalistic design meets warmth and sophistication in this contemporary cool bachelor pad, designed by San Francisco-based interior designer Tineke Triggs. 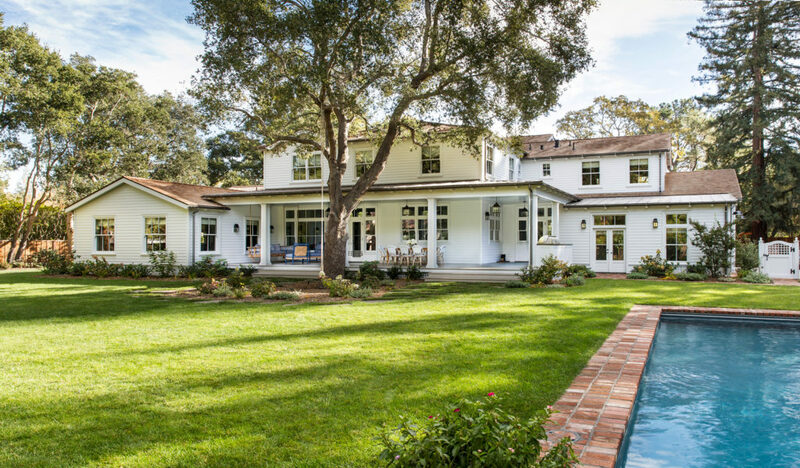 The 4,000 sf residence is home to a Bay Area entrepreneur who loves adventure travel, luxury cars and Indy 500 racing - and not necessarily in that order. 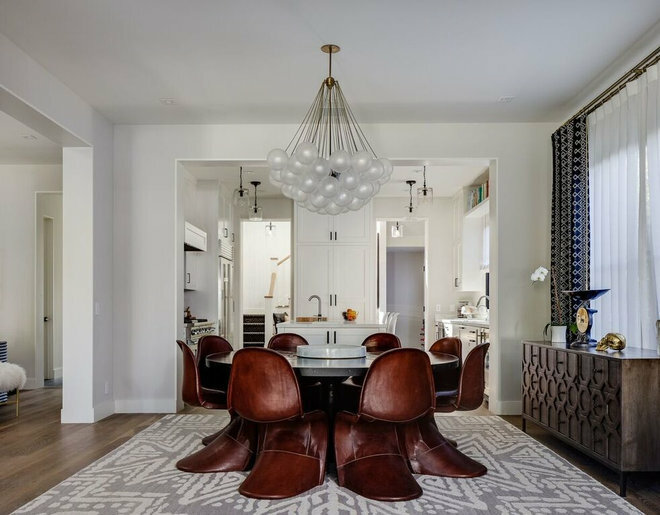 Favoring quality over quantity, Triggs and her team at Artistic Designs for Living designed a luxurious and sleek interior steeped in high style and masculine energy. Triggs walks us through her design process and the story on how each room came to life. Says Triggs, "The home had absolutely wonderful views, but an unconventional layout. It challenged us to be creative as we wanted to design an intimate environment that also maximized those views. For example, the great room was large and open and we wanted to make sure the room felt welcoming and cozy, not cavernous or cold. The room also had 2 focal points--the exterior view and the fireplace--so it was important to design for both vantages while maintaining a minimalistic design aesthetic." "The first piece we designed for the great room was the custom sofa. It has a unique shape with a 45-degree angle that allows views in multiple directions. We then continued with different accent pieces like the vintage chairs from Alex Fradin and the gorgeous Vladimir Kagan wing back chair. I chose both because they reminded me of the type of angular seating you'd see in a high end sports car. Our client loves to race cars and the wing back is his favorite piece in the room. For the artwork above the fireplace, I was looking for something clean that would bring your eyes up. When I found these striking black and white works by Justyn Chapman, I knew they'd be perfect." The Ondine wing back chair by Vladimir Kagan is the homeowners favorite piece in this room. The sleek lines are reminiscent of the race cars he loves to drive. A Luca drink table by Currey & Co sits beside it. Kelly Wearstler's stunning Dillion Cabinet sits just behind it. Triggs designed a custom sectional with a 45-degree angle to take in multiple views in this living room. A side table by Noble Goods sits to the side. Hand-dripped with liquid resin, no two are exactly alike. Triggs continues, "For the dining room we focused on linear, distinct angles that complimented each other. We wanted a mix of sleek lines and smooth shapes reminiscent of the race cars our client loved. We started with the buffet console from the Hewn showroom's Erinn V. Collection. I love this piece. Its three dimensional, angular and so incredibly elegant. Everything else was chosen to compliment the buffet." "The Welles chandelier is another striking piece in the room. It had just been introduced in glass when I was working on this project, which was perfect as we didn't want a heavy piece that could block the views. 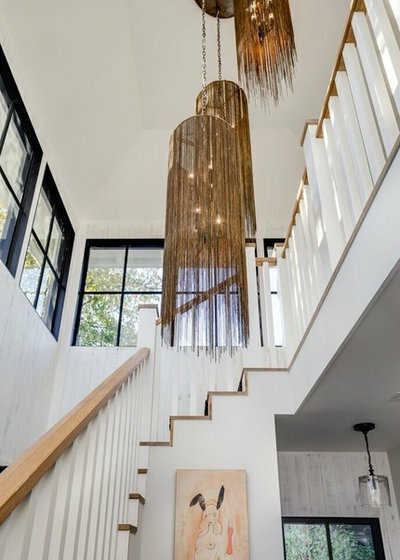 It was also important for the fixture to be linear, not vertical, as this space is opposite a vertically hung waterfall chandelier in the entry." A vintage chandelier hangs over an Eero Saarinen round table and a set of Strike chairs by Arrmet Studio. "The shape of the entryway was a challenge - it had no depth so we had to design a narrow piece that would fit the space but also hold your interest. I designed this console using walnut and brass accents and paired it with geometric scones by Lucive. Because the chandelier in the space is light and airy, I wanted these sconces to be more architectural and sculptural. The brass accents on the inside of the sconces provide another element of interest. " "For the master bedroom we wanted to create a mood that was both romantic and masculine. We continued the palette of soft blues, grays and creams to create this balanced aesthetic. The ceilings were 10 feet tall with long and narrow windows, so we needed the bed to have a tall headboard to anchor the space and feel in harmony with the windows. We chose the Vibia slim pendants for the bedside lighting as they reminded me of ones you'd find in a luxurious, high end hotel end and I wanted that vibe for my client's bedroom. The pendants are masculine and refined. They're very cool but not at all overbearing." 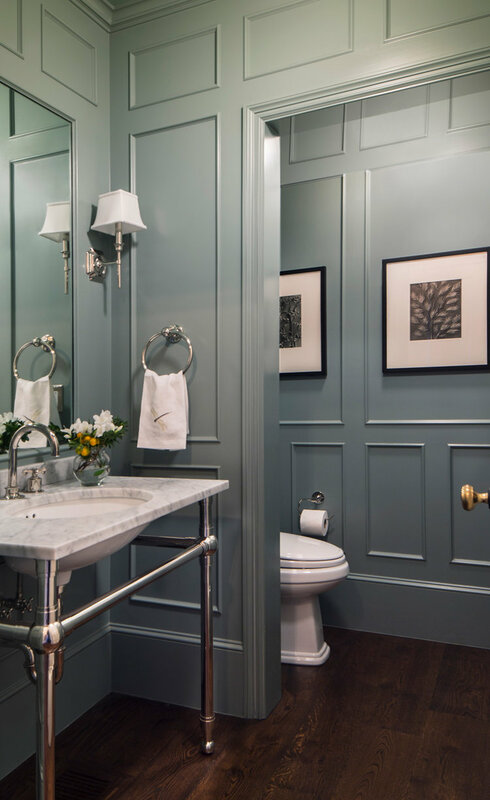 "For the walls in the master bath, I chose a textural Phillip Jeffries wall covering from De Sousa Hughes as I wanted to soften the room and make it feel less cold. I love how the textured element warms up the space." "Then came the library--what a fun room to design! We wanted this space to have a bit of the unexpected while still maintaining the feel of a formal library--a place you might end the day with an after dinner drink. When we found the amazing "Bruce" wallpaper by Abnormals Anonymous, we could not resist. I think we can all agree that a stripped down whale is a bit unexpected! Its such a fun design element and I loved the idea of bringing an ocean reference into the room. The space also includes a TV which we hid behind a door panel. I added brass side brackets to the built-ins draw your interest to the shelving and further the focus on the fabulous Bruce wallpaper. I always like to add a little jewelry to my cabinetry, and this was an fun way to do it." The basic white siding and burnt-orange, louvered shutters on this Los Angeles house plainly say “American 1950s residential traditional,” says homeowner Dan Brunn, an architect. But step inside to find a two-story living room with bleached wood floors and white walls punctuated with bold, contemporary artwork. The sleek, minimalist interiors satisfy Mr. Brunn’s modern aesthetic, while the nondescript exterior lets his home fit into the small, older Brookside neighborhood of Los Angeles. “I thought, ‘Why mess with something if it’s OK?’ ” recalls Mr. Brunn, 40, who spent about $500,000 in a yearlong renovation. The real-estate recovery in recent years has triggered the rise of undercover luxury homes—properties with modest exteriors and opulent interiors. Owners in gentrifying urban neighborhoods, historic districts and traditional suburbs are taking a less-is-more approach to their exteriors, opting for subtlety, normalcy and privacy. A look at some homes where the owners opted for muted exteriors but splurged on contemporary design and decor inside. “It’s the end of the statement house,” says Tineke Triggs, an interior designer in San Francisco who says most of her clients now want designs that don’t flaunt their exteriors. 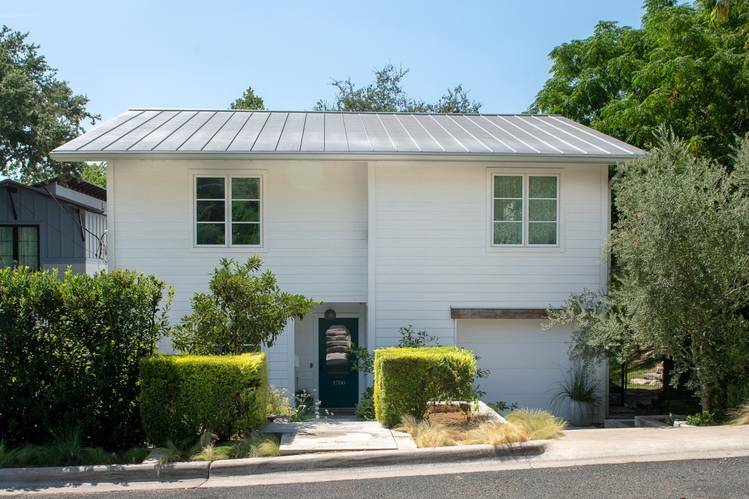 In Austin, Texas, Kelly and Carlos Gonzalez, didn’t want their brand new 3,000-square-foot home to stand out among the homes in the historic Bouldin Creek neighborhood. To that end, the front façade of the farmhouse features white, composite clapboards, modest-size windows and a traditional roofline. On the back of the house, however, walls of windows, a geometric deck and a third-floor master bedroom make a modern statement. Interior finishes include Carrera marble, custom-wood floors and reclaimed wood beams, she adds“I wasn’t trying to woo visitors, I just wanted to blend in with the neighborhood,” says Ms. Gonzalez, 44, a stay-at-home mom who is also an interior designer. Her husband, also 44, is a medical-device sales executive. The couple spent about $1 million on construction, with Ms. Gonzalez acting as the general contractor. Curb appeal plays a significant role when listing a home for sale. But elaborate patios, fire features and swimming pools aren’t necessarily the best investments. Instead, basic yard care and improvements yield the highest returns. New construction proves especially difficult to create a look that fits in, says architect Carina Coel, who worked with the Gonzalez family. She also suggests facades with a low profile and standard-size doors and windows. She stays away from using pricey materials that can be spotted from the curb, such exotic woods, stone, heavy steel frames or glass. “I want to use materials that are kind of classic,” she says. In the past few years, she has had several clients interested in a more pared-down look after “a lot of pushback” from neighborhood groups averse to more modern, showy construction, she adds. 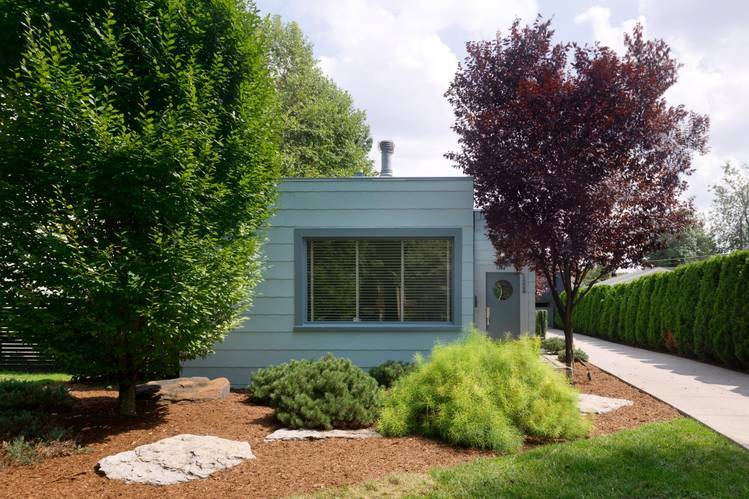 David Gilbert purchased a 1930s early Modernist prefabricated home for $74,000 in the working-class Prestonia neighborhood of Louisville, Ky., in 2010 with plans to rehab the investment property and sell it for a profit. By 2016, he’d changed his mind. “I started to like the house,” Mr. Gilbert, 62, a former music executive who now owns a bar and other real estate in town. So he added an in-ground pool, new lighting and a screened-in porch. 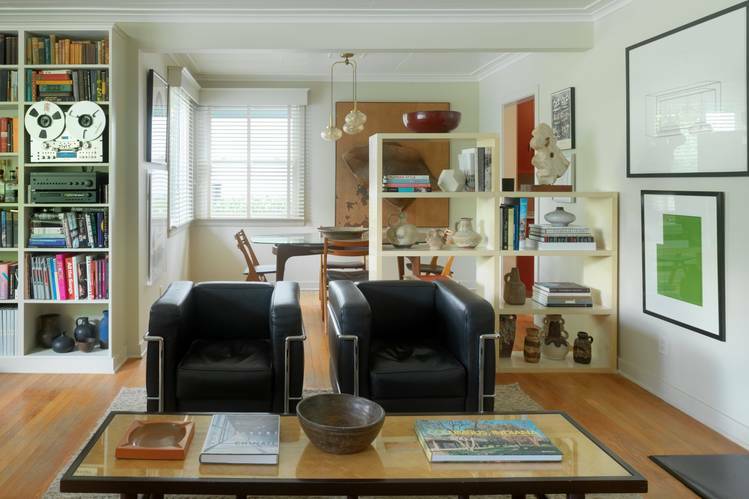 He also moved in his art and furniture collection, which includes a piece by minimalist artist Donald Judd and vintage Le Corbusier chairs. This year he finished the basement to include a large bathroom with a soaking tub and a workout area. For the exterior, though, he simply repainted the siding and added landscaping for more privacy. “The façade was left simple and plain,” says Mr. Gilbert, 62, who estimates the renovations cost about $250,000. “The house doesn’t flaunt [the amenities] in any way,” adds Louisville architect Jeff Rawlins, who worked with Mr. Gilbert on the renovations. 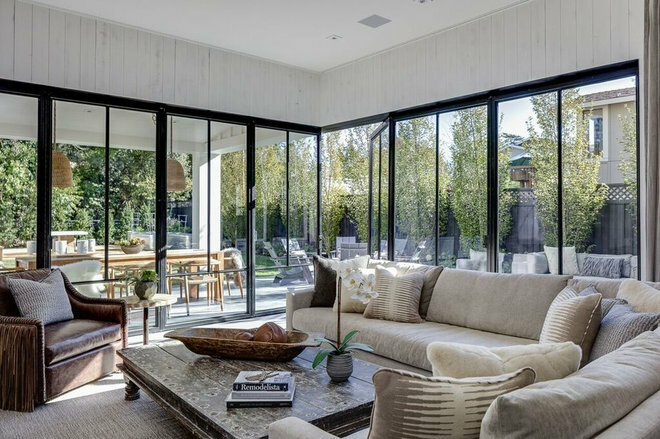 In the back of the home, Mr. Rawlins designed high walls to prevent onlookers from seeing the pool area in the renovated backyard from the alley. “It’s sort of like a little oasis. He has everything he needs,” says Mr. Rawlins. Adding trees helped the house blend in from the curb, he says. The low-key look may hurt homeowners when it comes time to sell. From the street, spotting undercover gems isn’t easy for potential buyers. 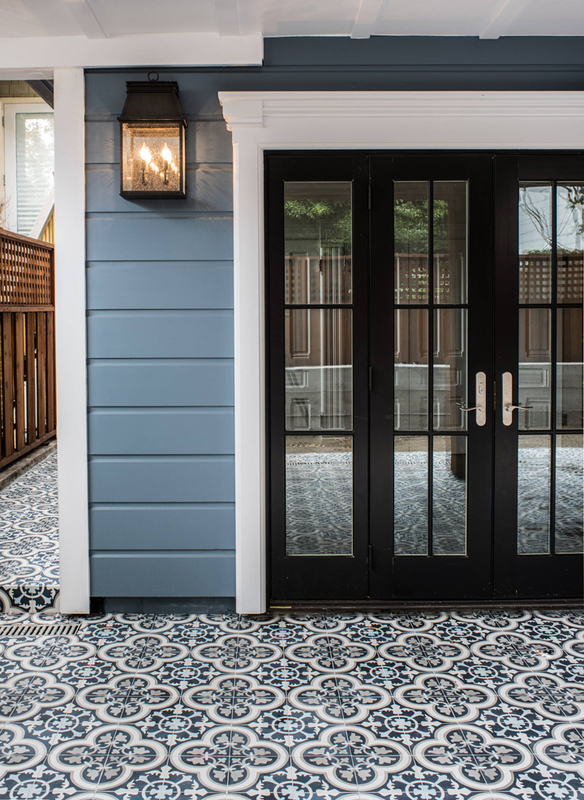 Trey Phillips, real-estate agent at Moreland Properties in Austin, urges house hunters to look beyond the facade’s design and instead examine the exterior materials used. “The quality of windows and doors will tell you a lot,” says Mr. Phillips. 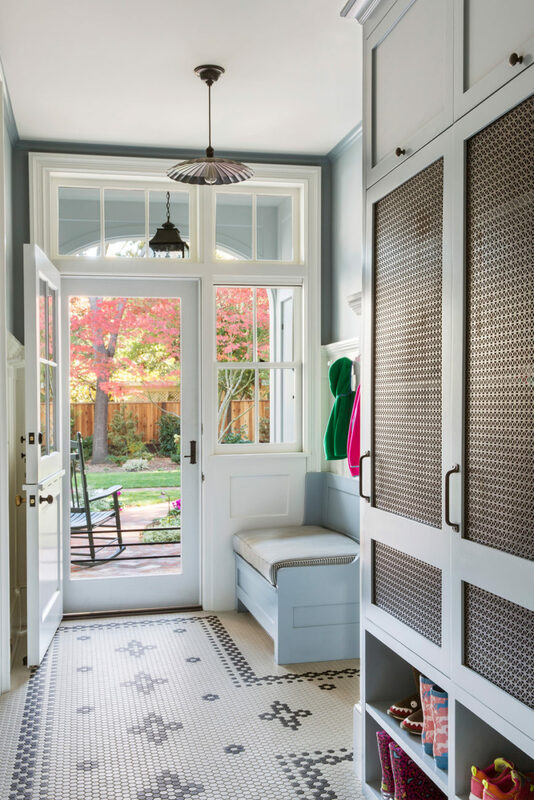 When listing a home, Mr. Phillips highlights construction elements that may not be apparent to buyers, such as roof quality, the construction of walls and things like solid-wood versus hollow-core doors. Still, nondescript facades risk boring potential buyers. In a survey of 6,911 real-estate agents conducted earlier this year, 94% of respondents suggested improving the home’s curb appeal before putting it up for sale, according to a the National Association of Realtors. Landscape maintenance, an overall landscape upgrade and lawn care were projects most likely to appeal to buyers and add resale value to the home. When it comes to San Francisco history, this Jackson Square building has more than its share. It’s constructed from lumber salvaged from the ships that clogged the bay when the enterprising 49ers rushed into the city and then to the Sierras to find their fortunes. Because pre-1906 records are spotty thanks to the legendary earthquake that leveled the city that year, no one is quite sure when it was built. But its original use was as a horse stable. Before cars were commonplace in the City by the Bay, horses were quartered in common stables—something like an equine parking garage. In an ironic twist of fate, many of the large stables were converted into actual parking garages when cars became the dominant form of transportation. There’s some evidence that this building went down that conversion track, but history didn’t stop there in this case. It’s been through many cycles of ownership, and has served as, among other things, an antiques store and an architecture office. Today, thanks to a recent renovation that marries the past to the present, it’s home to the investment bank Scenic Advisement. 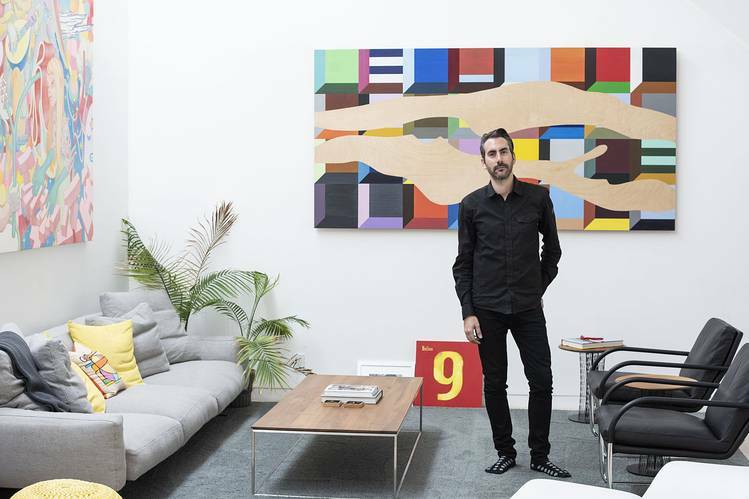 The investment bank created by Artistic Designs for Living and Feldman Architecture dispels the concept of a “stuffy bank.” Artwork by graffiti legend Ian Ross hangs in the entry. Architects at Feldman Architecture and interior designer Tineke Triggs, principal at Artistic Designs for Living, were hired by Scenic Advisement to transform the space into a unique office that has a lot of style but no stuffiness. In this office, the unconventional features include a rowing machine. 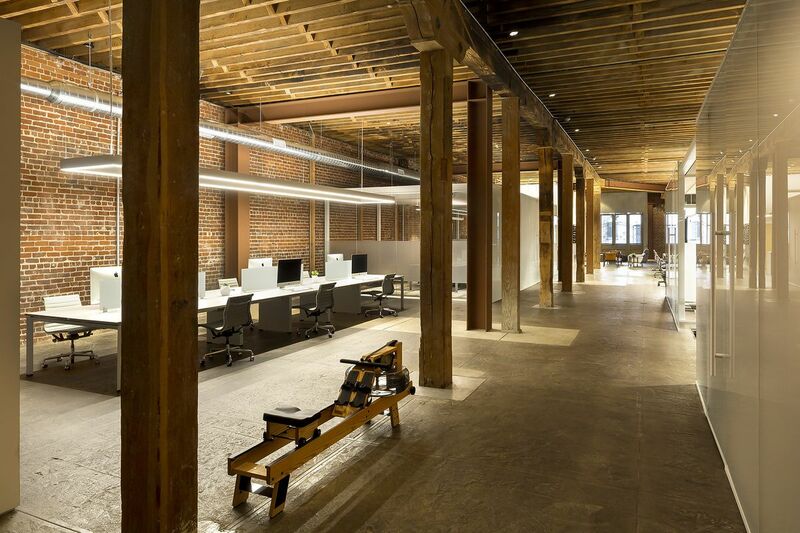 The goal of the design team was to open, not divide, the space. Architects created glass conference rooms that provide privacy without blocking the light. 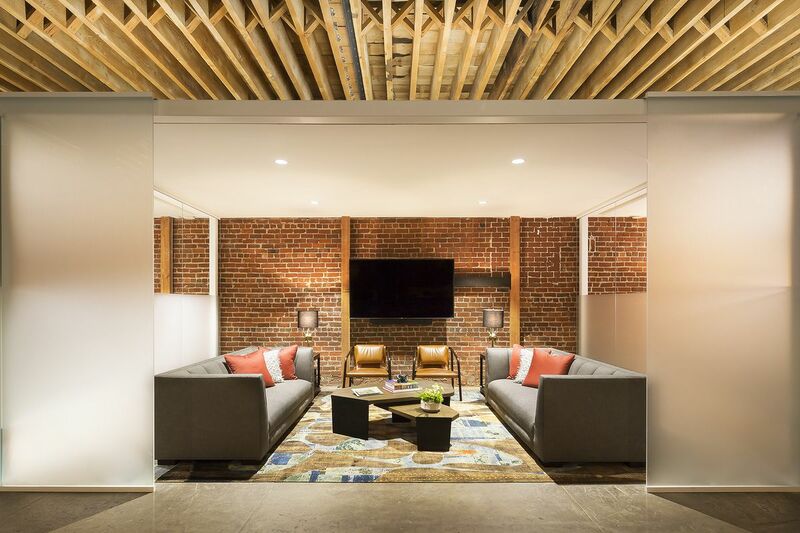 Those concepts manifest as a background of original brick and rough-hewn timbers with glass-enclosed conference rooms, a tea and coffee bar, a gym (not shown), and a long work table defined by a rectangular light fixture. Throughout, Triggs installed compelling art. In the lobby it’s a piece composed of used spray paint cans, the work of Ian Ross, a local graffiti artist. 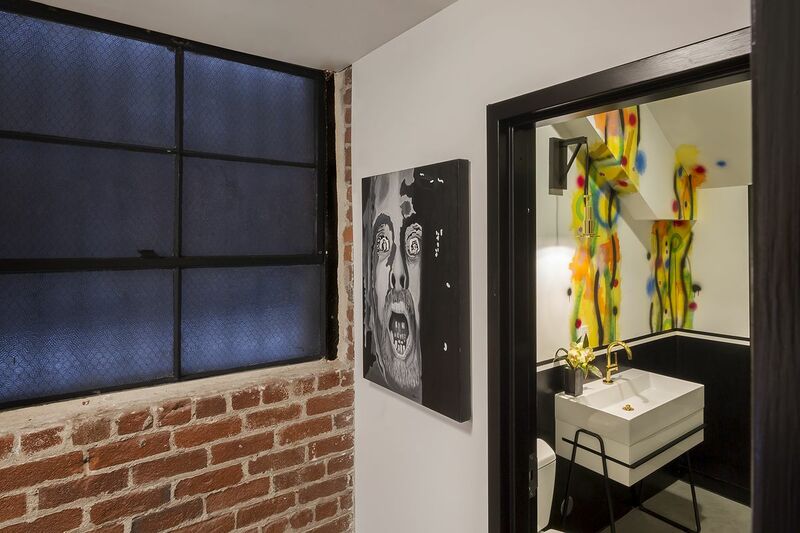 A bathroom is decorated with stripes of graffiti by Elan Evens. 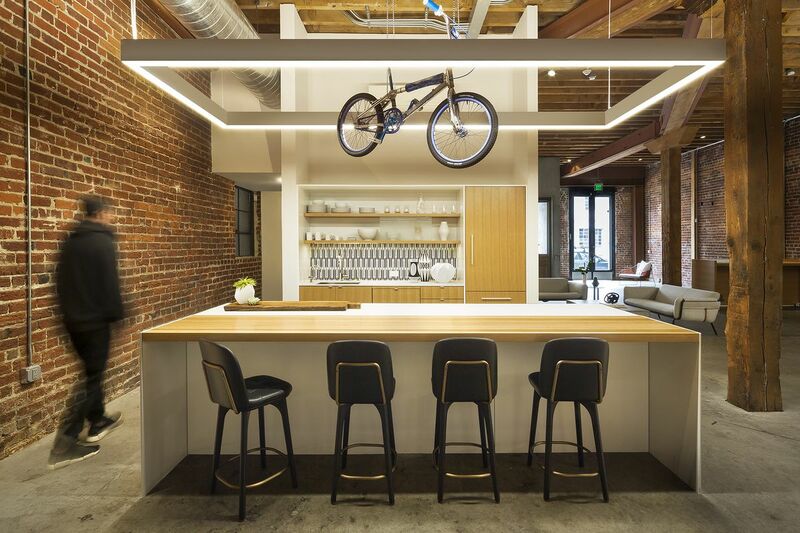 An open kitchen, coffee, and tea bar is topped by a kid’s bike once used by one of the principals. In this office, everyone works at one long table. Design by Tineke Triggs, Artistic Designs for Living. Growing up in Woodside, CA with Dutch parents, Tineke’s designs reflect the captivating mix of her Californian roots and European heritage. 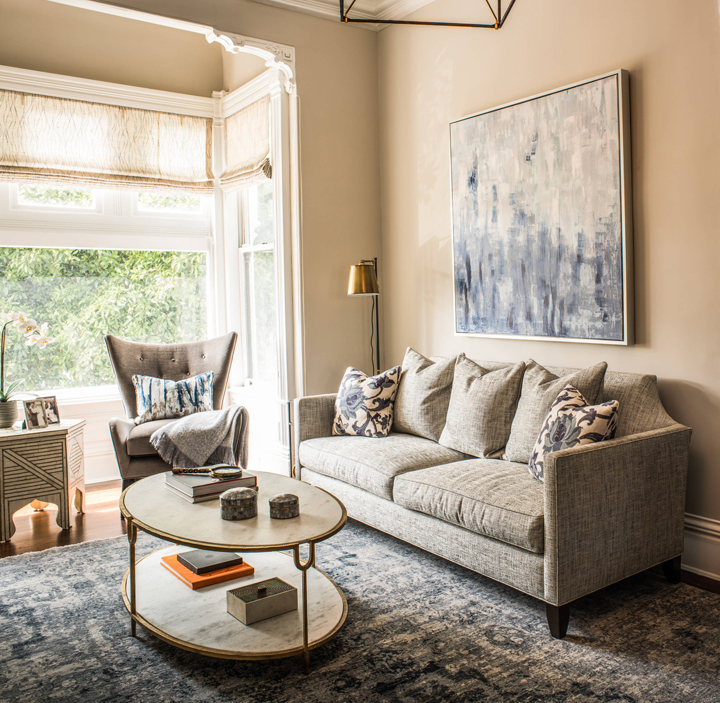 Inspired by designers who broke away from the pack, Tineke is known for creating sophisticated, chic and eclectic interiors. She finds passion in discovering the elements that make each house a home and has a knack for incorporating imaginative details into her designs to create truly memorable spaces. 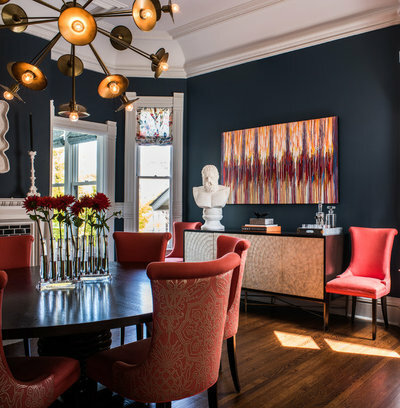 The veteran of four San Francisco Decorator Showcases with countless published interiors and design awards, Tineke’s work has been featured in numerous design publications including Luxe Magazine, California Home & Design, Modern Luxury Interiors, California Homes, SFC&G and Gentry Home. Like many before me, my path to interior design was an interesting one! As a child, I would draw and paint whenever I could – I loved art but I was slightly terrified of becoming a starving artist when I grew up, so I ended up studying math and engineering in college. I went to work in investment banking and then technology sales, but found myself longing for more creativity throughout those early years of my career. When I bought my first home in 1995, I completely immersed myself in the design process, taught myself drafting and became totally hooked with interior architecture and design. My engineering background helped me to understand architectural plans, my finance background helped me stay on budget and my creativity was able to flourish. I had finally found my calling and I founded Artistic Designs for Living shortly thereafter. It has been a wonderful journey! Your work is very timeless, but has great flare! How do you get that balance just right? I love the jewelry of design – the extra little pieces that add interest to a space and make the room come together. But a sense of balance is incredibly important in design – whether it’s blending classic furnishings with contemporary art, adding a bit of unexpected glamour to traditional décor or layering textures in a room to create something really soulful – getting that balance right is what good design is all about. If someone is working within a strict budget where do you encourage them to spend and save? I’m very pragmatic when it comes to budgeting and we take great care at the beginning of a project to establish a budget and work within it. But once that budget is established, I will tell the client not to worry so much about the individual prices, as long as we can stay within their overall budget. I like to splurge on a few unique, one-of-a-kind pieces that bring a room to life, and then adjust the budget to accommodate for those. Having rare finds and vintage pieces in a room is what makes the end design so special..
Do you have a signature that finds its way into every project? That’s a hard one, but I do love texture and a good pop of color where you least expect it. I try to design spaces that strike a balance between having enough interest to draw you in to the room, but not so much that it overwhelms. I like things to be in place, but I also love those unexpected design elements that add excitement to a space, something that pulls you in and makes you want to stay forever. Is there a current trend that you think will endure? I think the more sophisticated eclectic aesthetic that we’re seeing now will endure the test of time. It’s a very timeless way of blending modern furnishings with heritage pieces and perhaps a few treasures from the homeowner’s travels. When you bring those elements together gracefully, you can help each home tell its own unique story. The Europeans tend to design and live this way, and it’s an aesthetic that I think we’ll see more and more of in the US. Do you tend to have tried-and-true favorites that find themselves into every job? It’s different for every project, but I do get excited about new textiles and textures, and will find a place for them in every one of my projects. Whether it’s a textured wall covering, a fabulous fringe detail, or unexpected finish on a custom fixture – you’ll find interesting textures woven through all the projects I work on. What is your favorite recent project and what made it so special? My favorite new project is one that we recently completed in The Avenues. The home had been remodeled in the early 2000’s but was lacking in character and needed a lot of love. The client trusted our vision and gave us the creative freedom to achieve that vision for them. We created a timeless design with all the eclectic elements I love – vintage pieces mixed in with modern, wonderful textural elements, and unique pieces layered into every room. The end result was amazing and the client’s reaction was especially moving. They cried tears of joy when they saw the completed project – and so did I! Do you have a fantasy project? I would love to design Justin Timberlake’s house in Malibu – I just think he would be so fun to work with! I also think “The Rock” would be a blast and I really do believe it’s all about the people you’re creating for. They can bring such joy to a project and it’s really special when your clients become your friends at the end of a job – that’s incredibly rewarding. What are your favorite pieces on Previously Owned by a Gay Man and how would you use them in a project? This Michael Berman desk would be an amazing addition to a guest room I’m doing in a high-rise condominium downtown…. These mid-century chairs are perfect for an old school video game room I’m designing now. Pac-Man anyone? I love the curved design on this sofa and it would be ideal for floating in the middle of a living room I’m designing now – I want the focus to be on both the fireplace and the TV (which are in different corners of the room) and this would work really well. Home Builder: Erik Hughes, Hughes Construction, Inc. Architecture: Tim Barber and Kirk Snyder, Tim Barber Ltd. When it came to furnishings, Triggs saw it as her mission to respect the architecture while still being mindful of the youthfulness of her clients. “I wanted to work with traditional pieces, but not things that felt stuffy or like your grandmother’s house,” says the designer, who utilized transitional fabrics to support that concept. 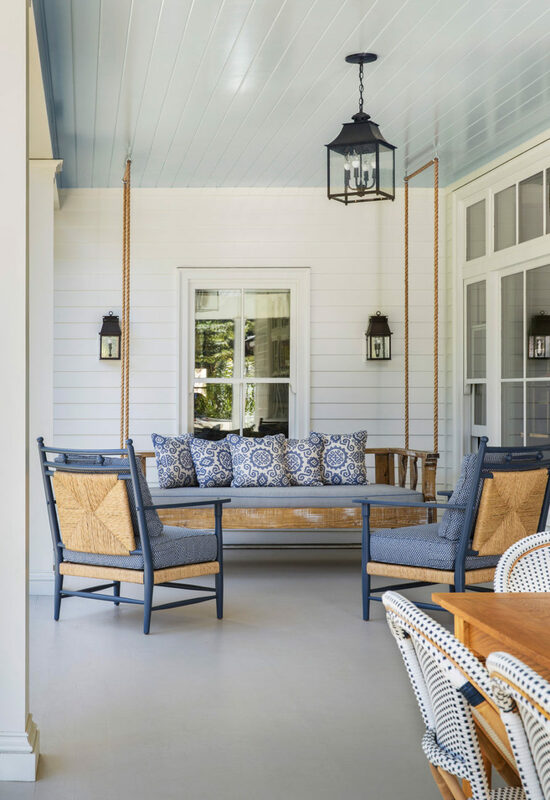 But if there’s any question about the home’s overall intent, the sight of the swing suspended by ropes on the back porch is a reminder that it’s time to slow down and go looking for that pitcher of lemonade. 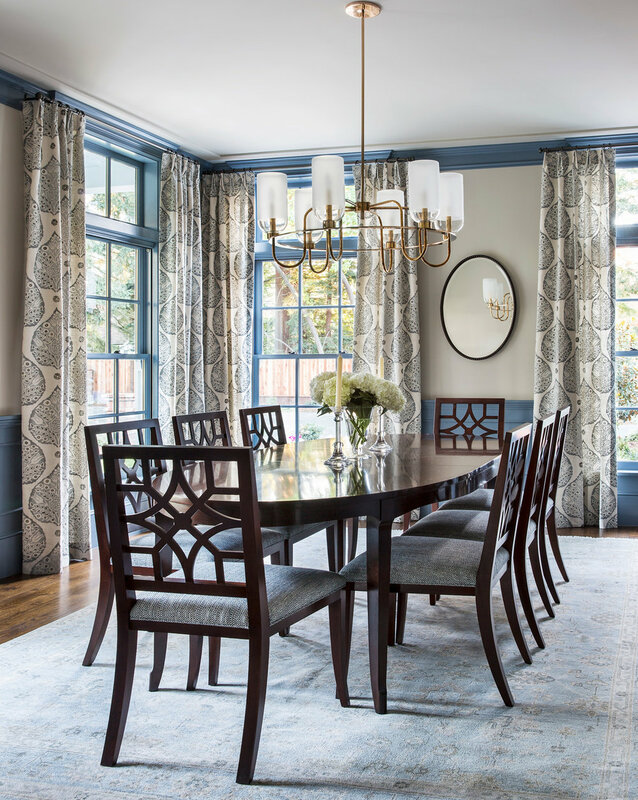 Interior designer Tineke Triggs put warm accents in front of a deep blue wall in a dining room. "It’s such a beautiful statement color that is both bold and elegant,” she says. “By selecting the right textures and lighting to compliment it, you can create a truly stunning space." 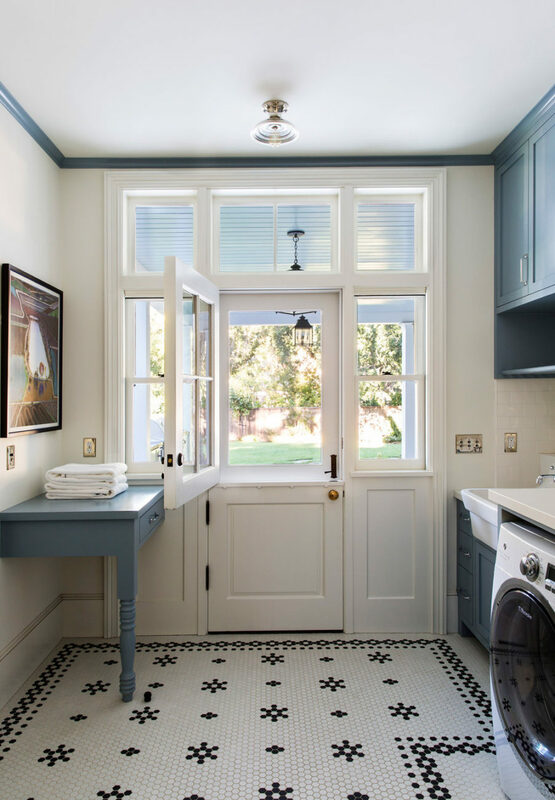 This San Francisco Victorian needed an update to make it suit the life of a busy modern family. But the last thing the owners wanted to do was lose any of the home’s original historic charm. 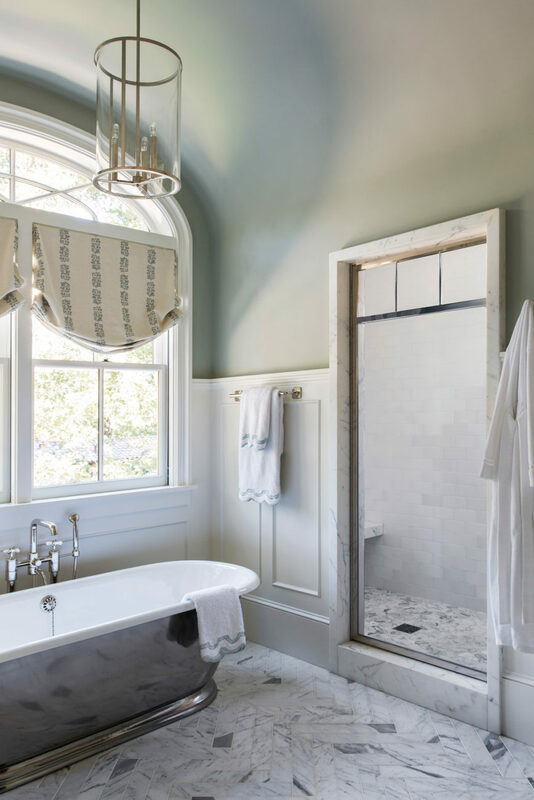 “This is an early-1900s Victorian with unbelievable details like handmade spindles on the stairway, beautiful fireplaces and ornate millwork — it all absolutely had to stay,” interior designer Tineke Triggs says. At the same time, she needed to make it comfortable and welcoming for the couple and their three young daughters. Carrying colors, textures and loose motifs throughout the house created the easy flow and comfort they were craving. 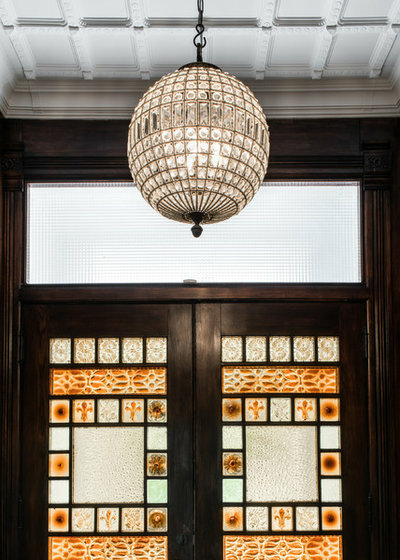 When you walk up to original doors like these, you expect to enter a home that has respected and preserved its spectacular Victorian-era architecture. Once inside, visitors are met with an ornate staircase and a view into the living room. When Triggs took the job, her clients had no furniture in the living or dining rooms; they had been living at the back of the first floor in the small kitchen and a family room. To create cohesion throughout the house, Triggs repeated certain elements. 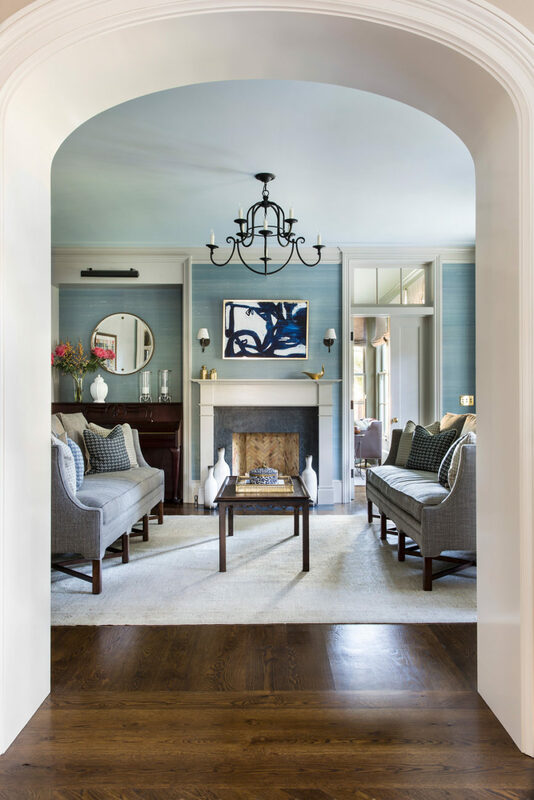 The homeowners’ favorite color, blue, carries through many of the rooms, as do mixed metals that include glints of warm brass. A sometimes blurred, sometimes brushed painterly quality shows up here and there, whether in exaggerated drips, watercolor-like patterns or ombré. For example, Triggs added the blue to an inexpensive painting to create this artwork. You can also see the painterly quality in the pattern on the rug and on some of the throw pillows. She custom designed this sofa. Note how the curves on the back nod to the original moldings around the adjacent bay. All of the fireplaces were in good shape except for their tile surrounds. Triggs used a classic deep blue in a brick pattern here. While the living room has a quieter palette, the adjacent dining room revs things up. Knowing that the homeowners loved blue, Triggs went for a dramatic, deep hue on the walls in the dining room. “We offset the blue by bringing in this persimmon chair fabric from the opposite end of the color spectrum,” she says. 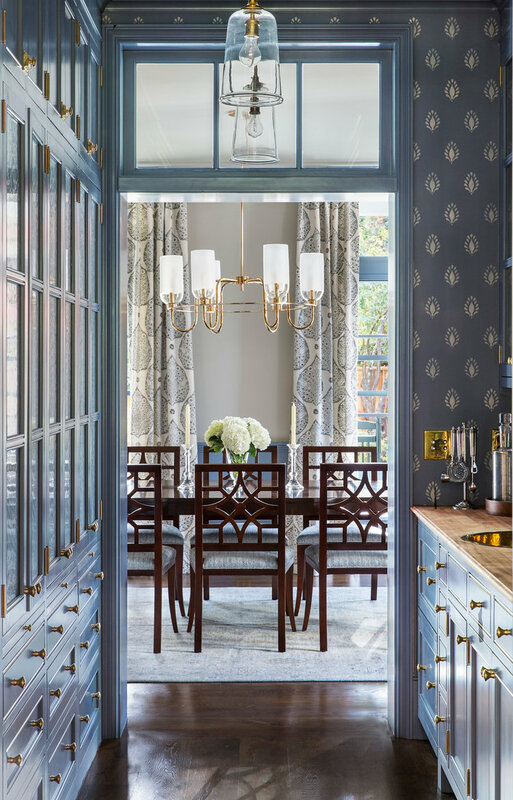 A large aged brass metallic chandelier makes a dazzling statement and stands up to the 12-foot ceilings. Metallic thread in the medallion pattern on the chairs, dynamic artwork and a buffet with pearlized doors complete the fashionable space. 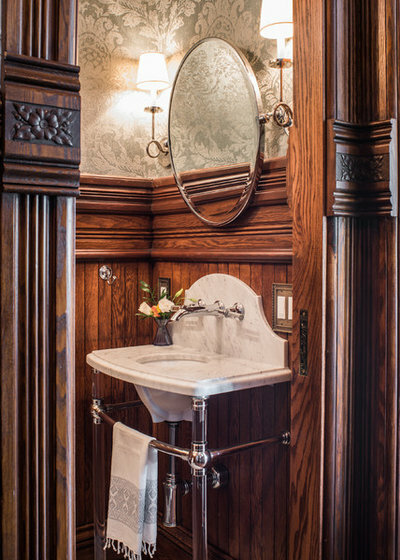 In and around the first floor powder room we get a close look at some of the original details and the way Triggs honored the Victorian era via the lights, sink and wallpaper. 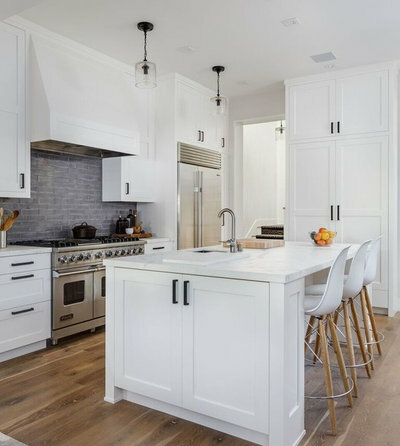 Creating a kitchen that could serve as the family hub and the heart of the home was a major part of the job and required the most extensive remodel. This space used to be the family room, and the space we’ll see next was the adjacent dated, inefficient and uninviting kitchen. While the former kitchen was small, the family had loved eating together at a small table just outside the space and wanted to keep something like it for casual family meals. So Triggs designed a long, removable, free-standing bench that resembles a banquette and a new Carrara marble top for an industrial table base that’s long and narrow enough to fit the space. The homeowners were worried that the patterned tile seen above the range would appear too busy if used all over the room, so Triggs used glass brick tiles behind the sink. She designed the island to have enough seats for the three girls, who are all younger than 10. Brass and gold tones reappear in the pendants, which have era-appropriate flair. On the back of the house, this sunporch space had served as the kitchen. After taking over the family room for the kitchen, Triggs transformed this room into a cozy den. Because the two rooms are open to each other, she used the same blue and cream fabric on the Roman shades in both. She also brought in more blue via paint behind the shelves and in the chunky, sweater-like rug. “We had the height here to make the room feel bigger,” Triggs says. Built-ins that extend all the way to the ceiling emphasize the height. 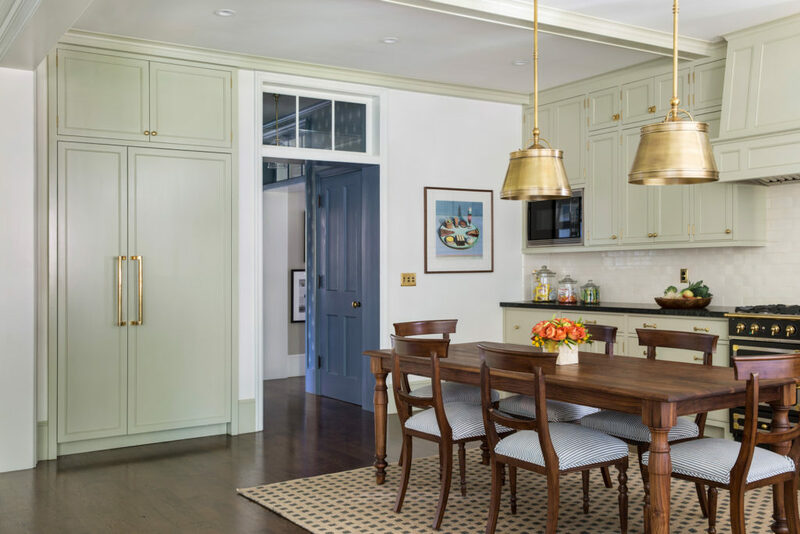 Wherever she added built-ins, cabinets and other architectural details, she emulated the style of the original millwork but in a slightly less ornate, more streamlined way to freshen up the look. Everyone in the family sleeps on the second floor. This light fixture is original to the home. 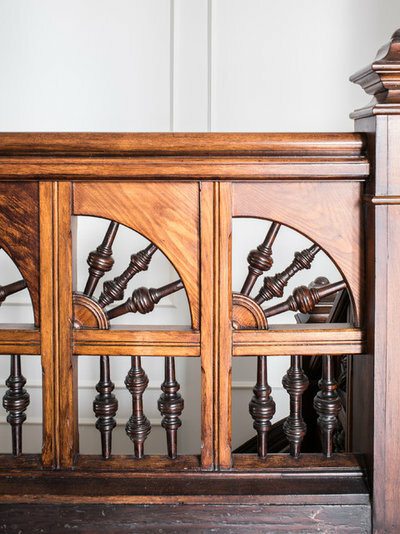 Here’s a close-up of the wonderful stair spindles mentioned earlier. The master bedroom has another beautiful original chandelier. The mantel is original as well, but Triggs added a new tile surround in a pattern appropriate to the era. The old one was orange-brown and cracked. The fabric on the chaise longue was the jumping-off point for the bedroom’s color palette. Triggs designed the chaise, which recalls a Victorian fainting couch. Ombré window treatments continue that painterly quailty we saw downstairs. The tall headboard stands up to the high ceilings in the master. “The headboard is upholstered in a wool-polyester blend that is so fabulous,” Triggs says. Soft colors and symmetry lend a restful and calm feeling. The details on the cabinet panels and mirror frames again nod to the silhouettes in the home’s original architectural moldings. 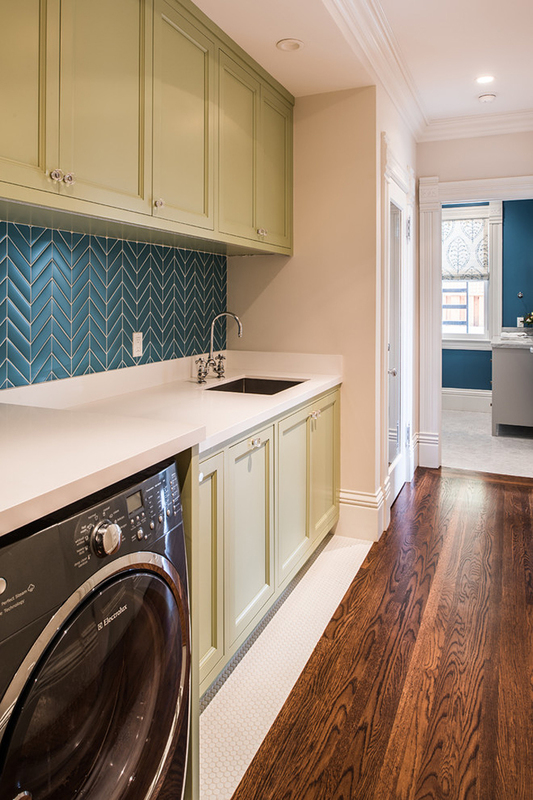 Carrera marble and seafoam green also befit the home’s history. In one of the daughter’s rooms, the new built-ins are in keeping with the style. So is this arch that cozies up her daybed. Typical of a home of this era, the closets are small. 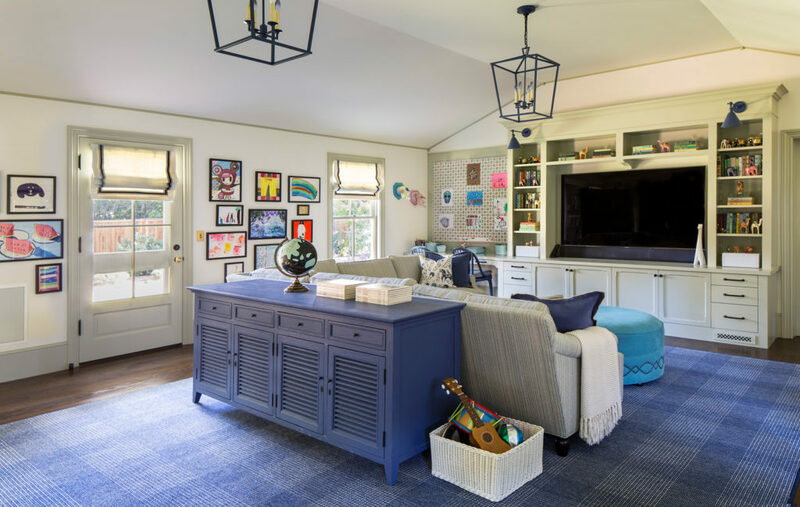 Triggs designed the daybed arch to be removable so that when the girls are older and move to a teenager’s paradise on the third floor, their parents will have the option of transforming this room into a large master closet. Up on the third floor, the rooms currently serve as a guest bedroom, a home office and this playroom. The painterly effect carries through up here with another ombré, this time on the walls. Triggs directed the housepainter to give the artistic assignment a whirl, telling him to “just break up the blues every few feet,” and it worked out beautifully. “Doing it any other way probably would have cost 10 times as much!” she says with a laugh. One thing to remember when you have a narrow staircase: Make sure the furniture will fit through it. Triggs chose a sectional that came in small pieces that would make it up the stairs. The home is now a place where the family will thrive, with thoughtful touches for both today and those future teenage years. And while its look is freshened up, the spirit of the original architecture remains alive and well. Happy New Year! I’m kicking off 2017 with this beautiful San Francisco home designed by Tineke Triggs of Artistic Designs for Living! 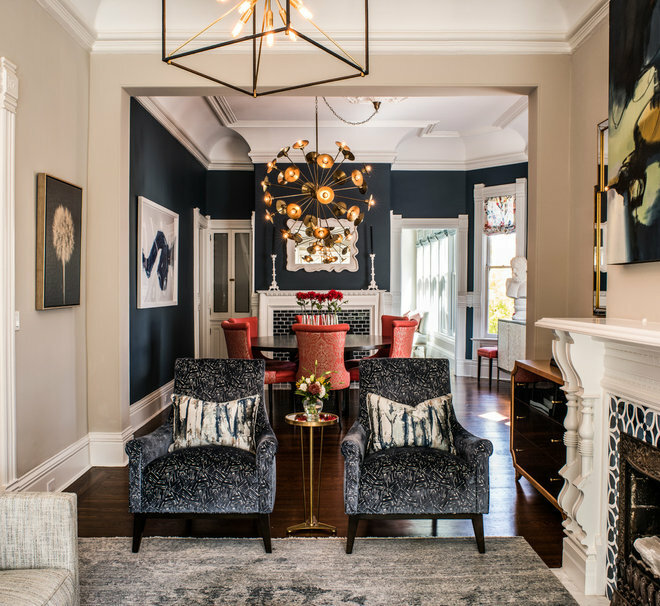 Captured by photographer Drew Kelly, the Victorian remodel perfectly blends daring design with traditional elements for a bold yet classic look. 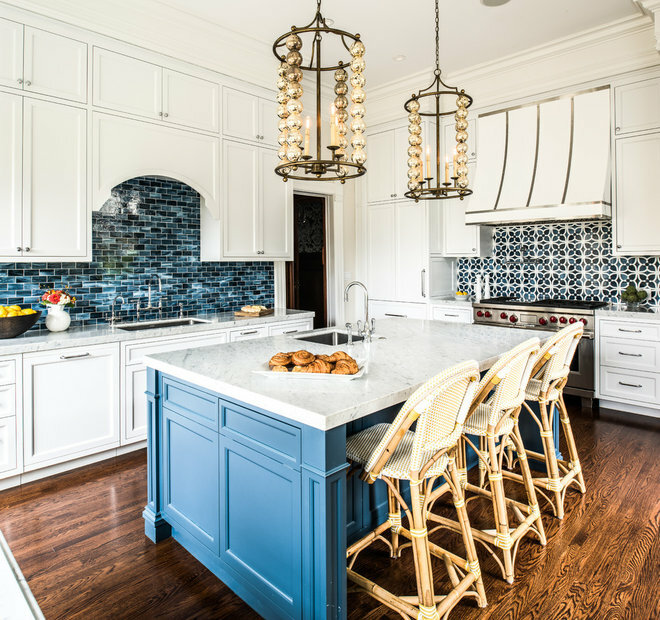 I’m positively in love with the kitchen here…the dramatic pendants and custom bistro table are fab, but you know I’m all about the gorgeous tile backsplashes! I love how they pop against the white cabinetry! The family room is another favorite space. The built-in shelves are great, especially with the painted backs! There’s still a lot more to see of the home…go here to finish your tour! And for another fun space I’ve featured by Tineke Triggs, go here! Homeowners’ request: A sophisticated, edgy and inviting space in which to reconnect as a couple and entertain friends. 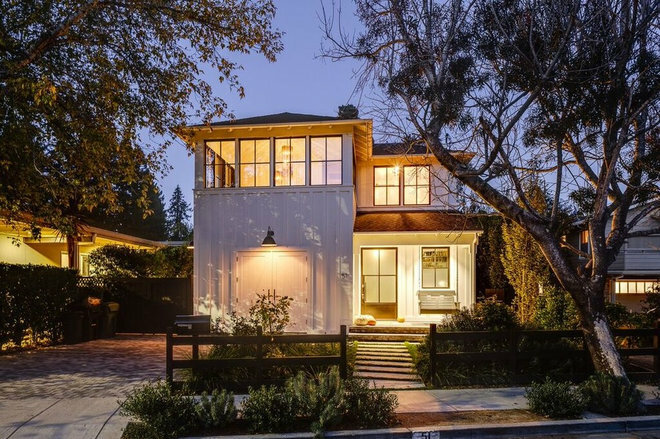 “Think Lenny Kravitz meets Mill Valley family life,” designer Tineke Triggs says. Fireplace focal point: Triggs felt that with a fireplace surround of waxed leather extending all the way to the high ceiling, she had few options for anything that could compete with it as a focal point. Instead, she played it up even more by creating a clear path to it, flanked by two custom sofas. 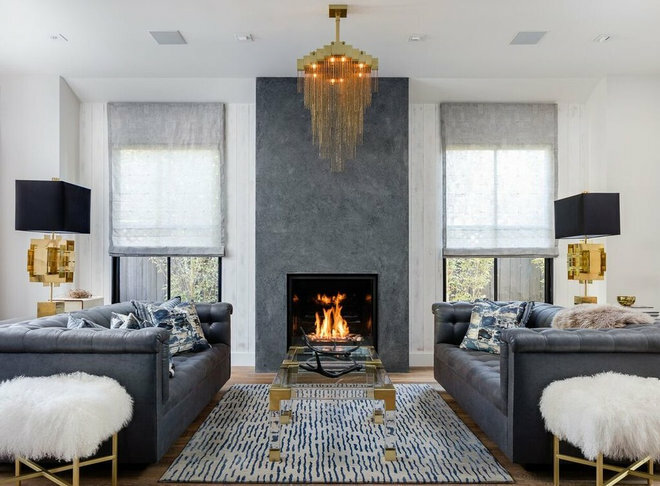 A barely there coffee table also keeps the visual weight on the fireplace, while a satin brass chandelier accentuates its height. It has been quite some time since Jo featured the carefully considered spaces created by San Francisco-based Tineke Triggs and her team at Artistic Designs For Living. They continue to create beautiful, dynamic and impeccable spaces that are unique...I was sold on the first photo above. Leather Panton chairs? YES PLEASE!!!! The musical La La Land, which follows the romance between a jazz musician and an aspiring actress, got 14 Oscar nominations today. It’s a visually gorgeous film, and no matter how it does on awards night Feb. 26, it’s a feast for the eyes. We’ve written about finding inspiration for room palettes on the runway, in nature and in your closet. Movies also can be a wonderful place to discover rich blends of colors you can apply to home decor. Take a peek at these scenes from La La Land paired with rooms that have a similar palette. Look at the attention to detail in this shot: The ocher color of Gosling’s tie reflects the color of the lamppost behind him, while Stone’s coral dress repeats the pink in the twilight sky. Gray also forms a major part of the palette, in the dark of the road and the lighter color of the fence on the left. 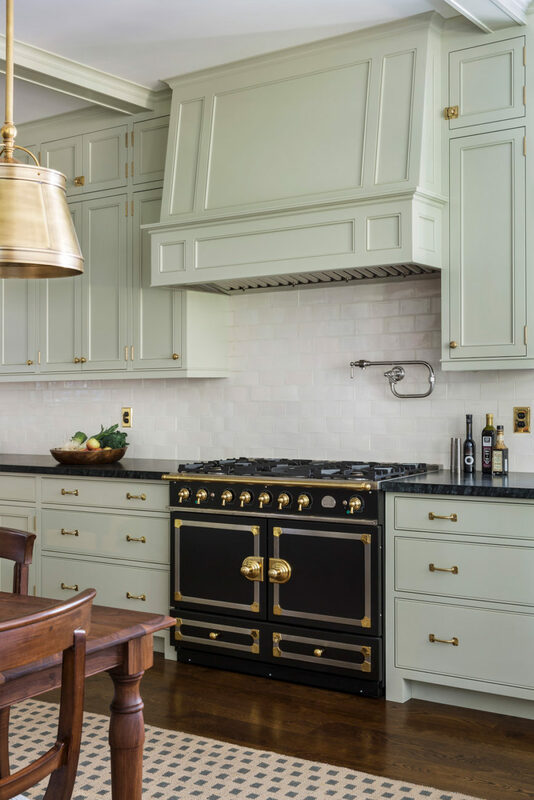 Charcoal-colored painted cabinetry grounds this kitchen in much the same way that the road provides a gray anchor in the movie shot. Pops of coral parallel the color of Stone’s dress, while the wood floor approximates — yes, it’s not 100 percent — the ocher of Gosling’s tie. The dark wood door at the back of the room imitates Gosling’s hair; the paint color in that niche echoes the concrete balusters in the movie shot’s lower left. Sheri Olson of Sheri Olson Architecture declares gray is her favorite color. "I always say, if it’s not white, it had better be gray," she says. She often selects the shade for interiors, and calls Pavilion Gray by Farrow & Ball one of her nearly foolproof choices. The architect says that she resisted the grayness of Seattle, where she’s based, for the first few years, but changed her mind. "I started to see what a wonderfully subtle color gray can be as the light changes," she says. Right: Architect Sheri Olson considers gray a timeless color choice. 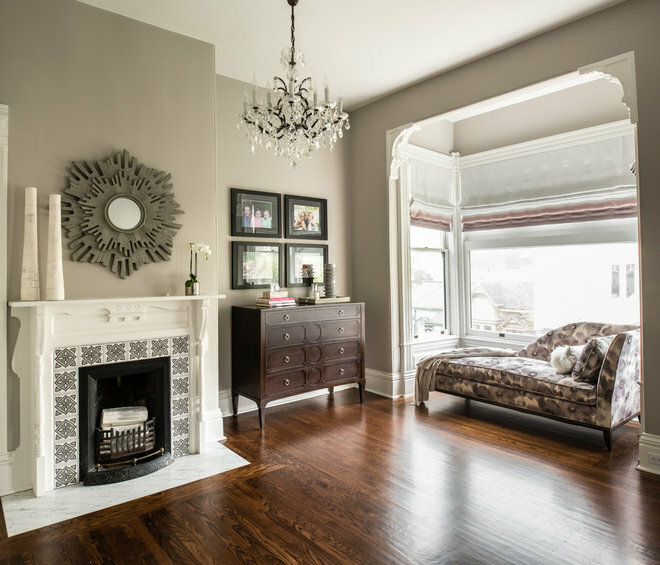 This living area is painted in Gray Horse by Benjamin Moore. 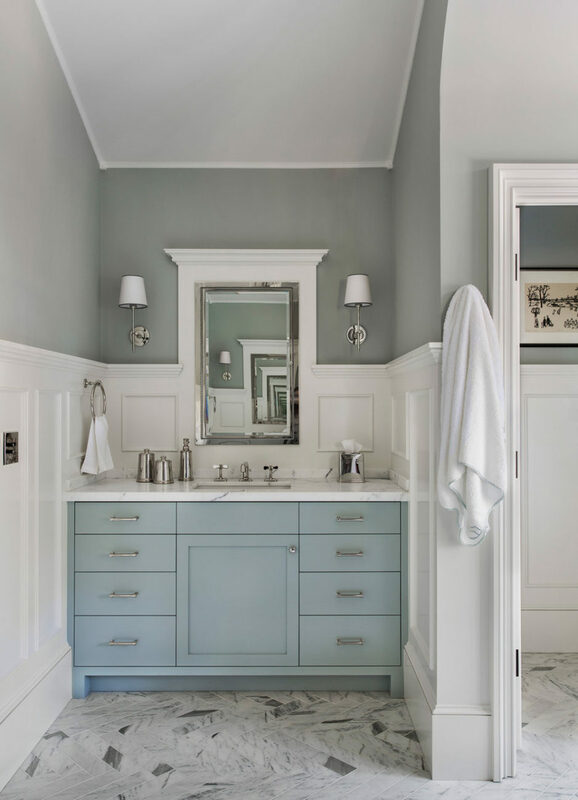 Left: Interior designer Tineke Triggs uses many shades of gray in this room, and selected Benjamin Moore’s Iron Mountain, a darker hue, for the cabinets. 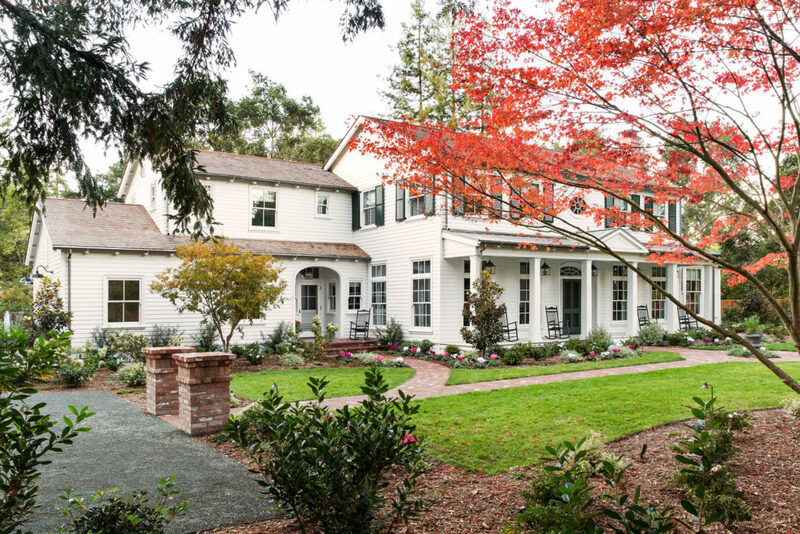 This beautiful home may be located in the San Francisco area, but it definitely has Southern sensibilities! 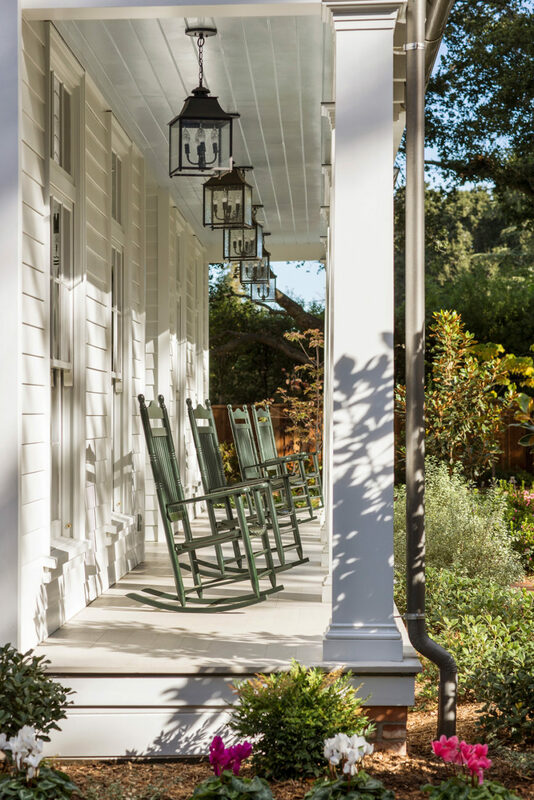 Los Angeles-based architect Tim Barber and senior project manager Kirk Snyder worked with interior designer Tineke Triggs of Artistic Design for Living to create the Georgian-style farmhouse for a couple who wanted their new home to evoke the spirit of their childhood homes in the South. Big porches will do just that! Builder Erik Hughes did a fantastic job incorporating many period details, with intricate trim profiles, crown moldings and wainscots throughout the home. And I love how Tineke respected the architecture while putting a fresh spin on things. I mean, how great is the blue-painted woodwork in the dining room? 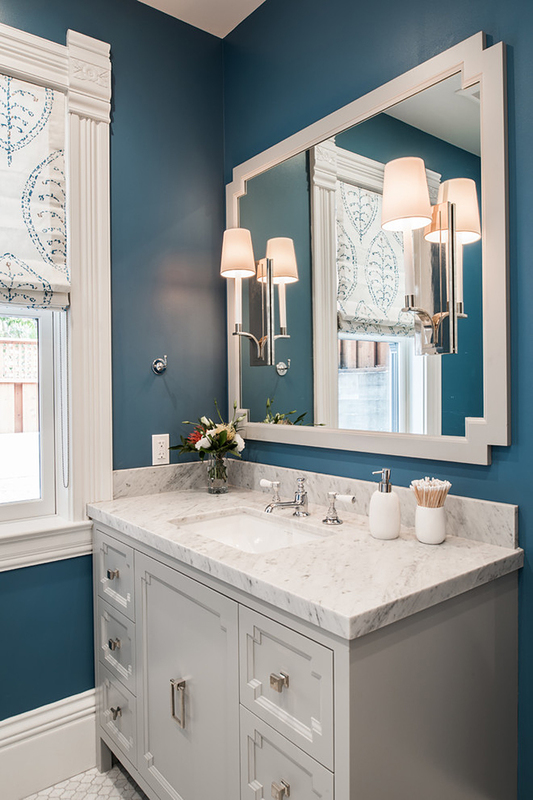 The shades of blue woven throughout are perfection really, especially in the master suite! Swoon! You can read all about the home, learn sources and see more photos by Laura Hull over at Luxe Interiors + Design! 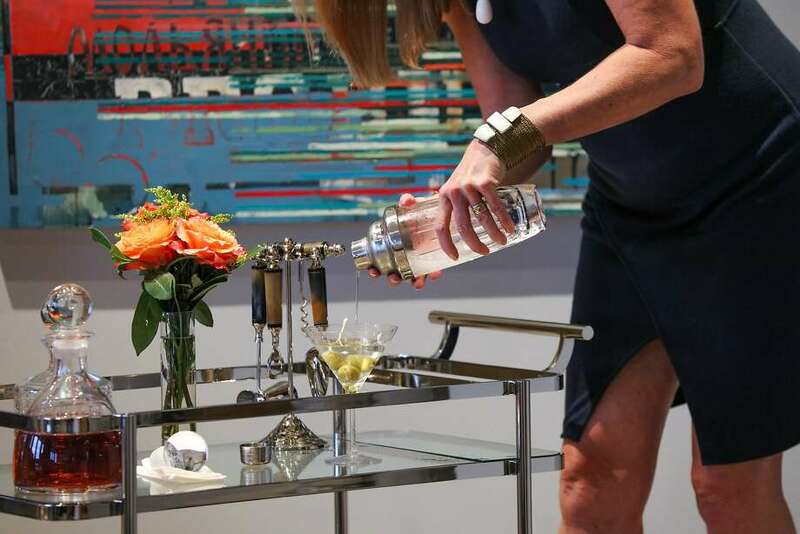 Interior designer Tineke Triggs pours a drink at the bar cart she arranged with a clean, uncluttered look in a client’s home. The holidays are fast approaching, and along with it, the entertaining season. For many hosts, the libations are as carefully considered as the food. So we asked local tastemakers to weigh in on the components of a good bar setup — from must-have tools and ingredients to go-to resources and decorative accents. Tineke Triggs is an interior designer by trade, but she also has a knack for making cocktails: At California Home + Design magazine’s mix-off competition at the Palace Hotel in September, her Alpine Mist took top honors. Perhaps the skill runs in the family, since Triggs recalls that her grandmother made the best Manhattans and would let her have one of the cherries from the drink. “I thought they were the best cherries I’d ever tasted,” Triggs adds. 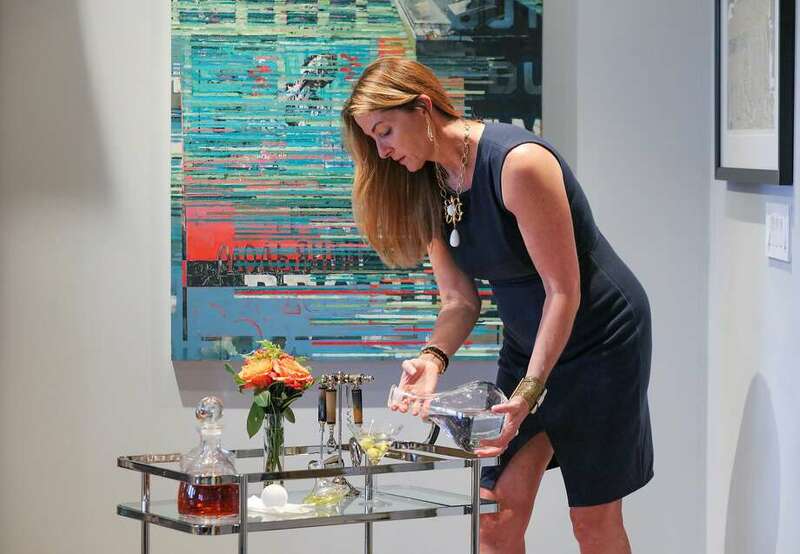 As a designer, Triggs is often tasked with incorporating a cocktail station for clients. The bar shown here resides in a home that “is neat and organized, so the thought of mismatched bottles out on display would not work,” says Triggs, who decanted the liquor for “a clean, uncluttered look.” The round decanters are from Anthem on Sacramento Street, while the square one is from Tiffany & Co.
A “Blue Valentine “ doesn’t have to be synonymous with “lonely." I grew up in a Dutch family where Valentine’s Day was a time to honor friendship and companionship more than anything else. The color blue symbolizes loyalty and trust, and a Blue Valentine-themed gathering is a great excuse to spend quality time with loved ones and celebrate your closest relationships - be it friends, family or significant others, let your love shine through this Valentines Day. I can’t think of a better way to kick off a Blue Valentine’s Day than taking a loved one for a spin in this gorgeous blue Aston Martin. Destination unknown - it’s definitely all about the journey here! These archery tacks are cast representations of arrow tails with a modern twist. Out of the ordinary and adorable. Pin these to any of those Valentines notes worth saving. After touring around in the vintage beauty, head home for a special meal and pull out all the stops with this gorgeous Hermes tableware. Its bold colors and exotic patterns are influenced by both European and Asian travels - a subtle way to bring different cultures together through beautiful design. No need to buy jewlery this Valentine’s when you have these Moroccan tea glasses that are like jewels themselves. Their gold etched details and dazzling colored glass make a beautiful statement for everything from cocktails to candleholders - even a traditional Moroccan mint tea. Good design doesn’t have to cost a fortune. This gold flatware from West Elm is elegant and festive and set a beautiful table. I love this Loom pattern from Guildrey and had it made into a gorgeous tablecloth - perfect for a Blue Valentine’s celebration! Tom Dixon “Steampunk”Candlestick Holders These brass candlesticks make great conversation pieces with an industrial vibe that still manages to feel delicate. The unusual design and solid material give these “sticks” major staying power. Good food, great friends, and a little too much wine…the perfect setting for an after dinner game of Cards Against Humanity. Edgy, outlandish and occasionally absurd - be prepared to laugh! A decadent Valentines treat that’s meant to be shared! Fluffy red velvet topped with luscious cream cheese frosting and just enough blueberries to count as a fruit…right? Add flour mixture to butter mixture alternately with buttermilk mixture, beginning and ending with flour mixture. Beat at low speed until blended after each addition. Spoon batter into muffin cups, filling three-fourths full. Bake at 350° for 18 to 20 minutes or until wooden pick inserted in centers comes out clean. Remove cupcakes from pans to wire racks, and let cool completely (about 45 minutes). Then add the icing. In a large mixing bowl, beat the cream cheese, butter and vanilla together until smooth. On low speed, add sugar until blended. Increase the speed to high and mix until very light and fluffy. 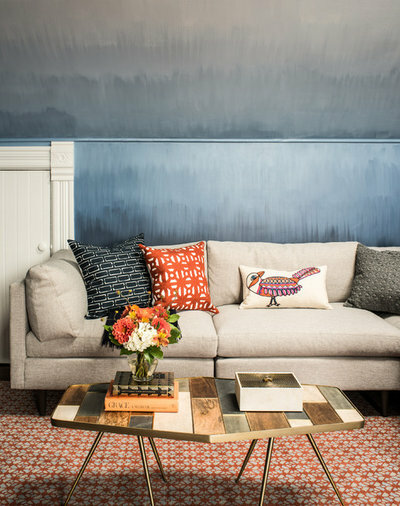 These homeowners found interior designer Tineke Triggs after admiring a very colorful room she’d completed for the San Francisco Decorator Showcase. “He called me up superexcited and said, ‘I loved your showcase room,’ but it was nothing like what I wound up doing for them,” Triggs says. Instead, a neutral color palette highlights brushed beadboard, rich saddle leathers, glittering brass accents, poofy faux fur and fringe — just a few of the textures the designer wound up weaving into this family-friendly modern barn-style house. The homeowners bought the house while it was under construction, so Triggs was able to help them choose the fixtures and finishes along the way. The house has a modern barnlike style that Triggs decided to play off without going all-out farmyard. “We didn’t want to do reclaimed, reclaimed, reclaimed everywhere,” she says. 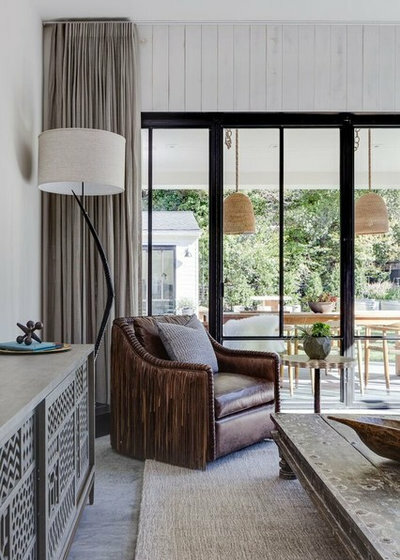 Instead she nodded to the home’s laid-back style via saddle leathers, more subtle rustic elements here and there, and chic finishing touches. “These clients are neat, organized and stylish, but they are also bubbly, enthusiastic and have a casual bohemian Burning Man side,” she says. Incorporating these aspects of their personalities while designing a home that was comfortable for young children resulted in a casual yet elegant style. In the family room, the finish on the walls was a happy accident. The painters had sanded down some of the first coat of paint on the beadboard to perfect the paint and were getting ready to add another coat. Regarding the whitewashed texture, Triggs says, “my clients and I saw it and said, ‘No! Wait! Leave it!’” They wound up using the brushed wood finish throughout the house. Textures play a big role in the mostly neutral-colored home. Rustic and polished woods, saddle leathers, wools, and faux furs meet glitzy metallics. Triggs loved getting fringe into the mix, as on this comfortable leather armchair. Because the couple has a young son and plans to have more children, Triggs also made sure everything was extra durable. “Today’s solution-dyed acrylic indoor-outdoor fabrics are so great, they really look like and feel like indoor fabrics,” she says. The Indonesian coffee table was the first thing she bought, after happening upon it in an antiques store. “I saw it and thought, ‘This is it,’” she says. She texted her clients a photo, and they immediately approved. “When you find these things, you have to grab them as soon as you see them,” she says. Indoor-outdoor living plays a huge role in the family’s lifestyle. Here you can see how the accordion-style doors open up two sides of the family room completely to the outdoors. Except for a small channel for the doors, the concrete from the patio flows right across the family room floor. 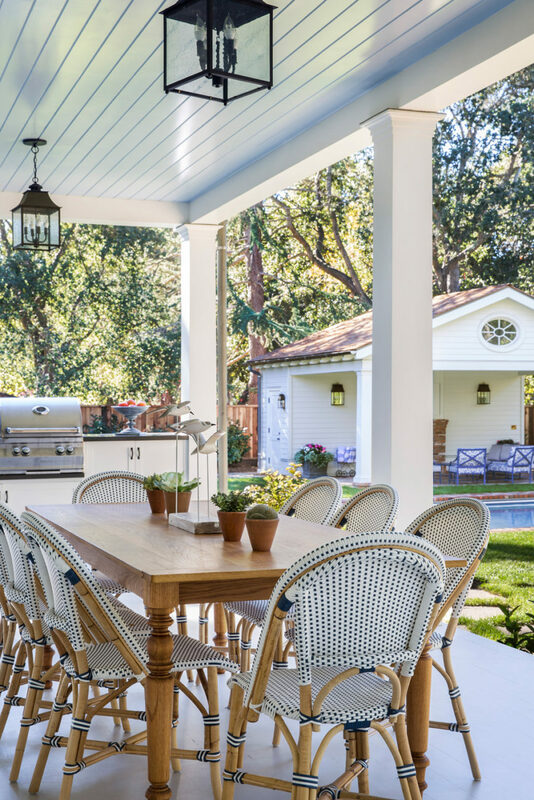 Triggs planned the layout of the yard accordingly, placing a dining table and chairs under the porch, along with an outdoor kitchen. Then she set up a lounge that can view the family room TV during a big game. “I really thought about how people would transition from outdoor dining to outdoor lounging,” she says. A group of modern Adirondack chairs from Loll Designs forms one conversation area, while upholstered pieces form an L around the fire pit. The outbuilding has workout equipment and serves as a man cave. The family also has an organic garden it harvests for meals and juices. Triggs and the photographer didn’t have to style a thing to make the kitchen look this neat. “They are very clean, organized and health-conscious. You should get a load of her fabulous jar collection — when you open up that tall pantry cabinet, it’s perfection,” she says. 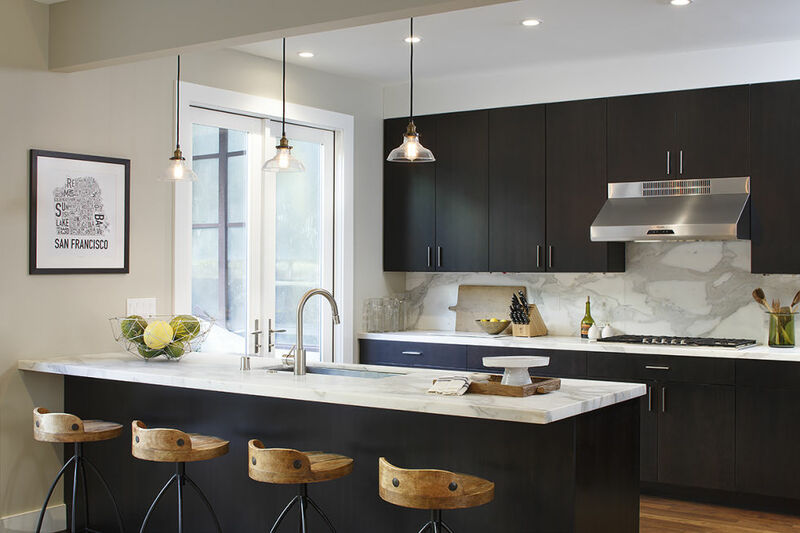 Simple modern Shaker-style cabinetry and dark hardware play off the modern barn theme. The statuary marble countertops add the chic factor. The backsplash is a crackled ceramic tile that looks like gray-washed brick. In the dining room, the sophisticated silhouettes of Verner Panton’s iconic chairs meet rich saddle leather. Triggs custom-designed the rug pattern, which has a Native American feel. The buffet and drapes continue the pattern play, while a bubble chandelier adds a glam touch overhead. The living room is not part of the open plan and is a more glamorous adult getaway. The furniture can still stand up to kids, though. Custom sofas fill the space and provide comfortable seating. The waxed leather and color of the sofas play off the textured fireplace surround. But the big star in this room is the cascading brass Kelly chandelier, which brings the high ceilings down to a more human scale. Little poofy stools add soft, eclectic texture, while the pattern on the rug adds movement. “I wanted high drama for the staircase — here I go again with my fringe,” Triggs says. She customized three chandeliers with chains of different lengths so that they could be enjoyed from below, while ascending the stairs and from the second floor. 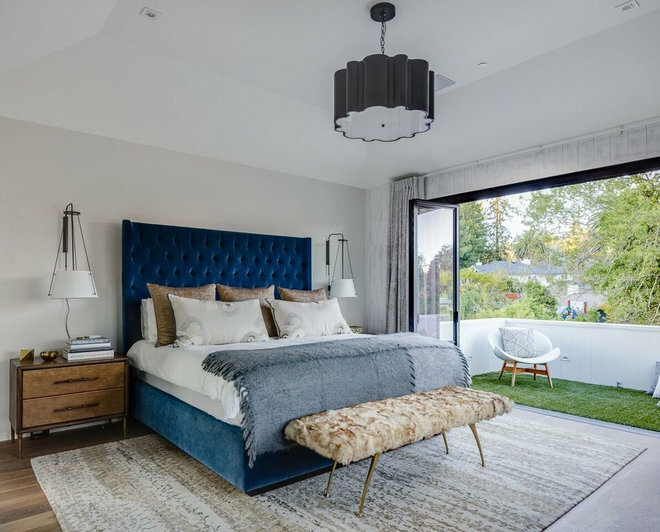 “Both homeowners were very involved in the design, and he really wanted a blue velvety bed, which is where we began in the master bedroom,” Triggs says. 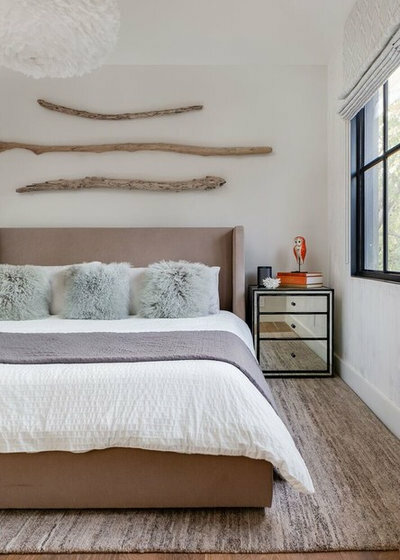 The tall headboard gives the bed a strong presence. She found the vintage bench in an antiques store in Santa Barbara, California; it was another one of those things she had to grab as soon as she saw it. Indoor-outdoor living extends out onto a small balcony, covered in artificial grass. “It makes their dog feel cozy out there,” she says. The nightstands were custom-made, and the designer added horn handles for texture. Suspended reading lights bring an industrial touch. 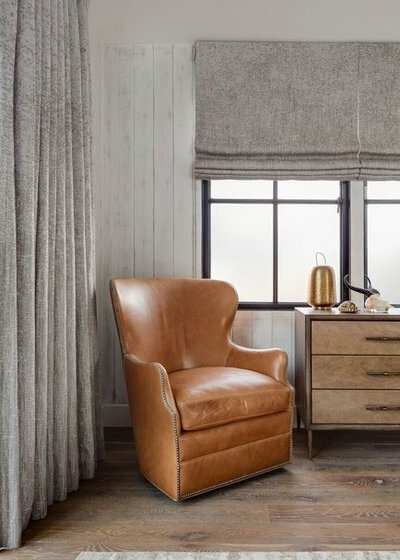 Triggs worked more saddle leather into the master bedroom via this comfortable armchair, which swivels toward conversation and views. A dresser matches the nightstands. “These drapes are so great, they remind me of aspen trees, and they go so well with the brushed wood,” she says. The guest room is a mix of hard and soft accents. The sticks are found objects the clients collected. The bed was the couple’s former master bedroom bed, repurposed after velvety blue struck their fancy. 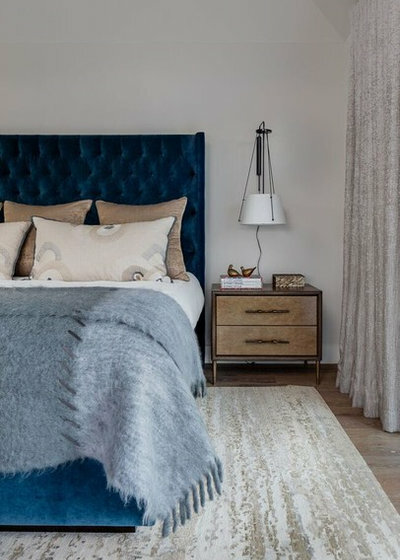 A feathery light fixture plays off the faux fur pillows, while mirrored nightstands add a contemporary touch. What inspired this career path for you? Being creative has been a major source of joy for me ever since I was a little kid, but I really got hooked on interior design when I bought my first home. I had such a tight budget for remodeling that I ended up doing it all myself – and I absolutely loved it. I had always dabbled in different artistic hobbies, but that was the moment I realized I had found my true calling. What is your go-to source for inspiration? I draw a lot of inspiration from my travels abroad, and when designing for clients I will often think about the places I’ve been, different styles I’ve admired, and the history and culture that inform those styles. I have a Dutch/Belgian heritage, and I adore European furniture design and the whole European eclectic movement. Tell us about your creative process. When I first meet with a new client, I sit down to clear my mind of any other projects I’m working on and try to get a very clear picture of the people I’m designing for and how they live. Do they entertain frequently? Have small children? Love to travel? I try to envision them in their happy place and then set to work on creating a beautiful but liveable environment that suits their personal style, whatever it may be. Describe your style in 6 words or less. Eclectic, chic, vibrant, playful, and, most of all, balanced. What’s a staple in your tool kit? My pencil and my sketchbook go with me just about everywhere. They enable me to think outside the box and capture design inspiration whenever and wherever it strikes! Who do you look up to in the design world? Dorothy Draper, Kelly Hoppen, Tommi Parzinger, Kelly Wearstler, and my most favorite Italian designer of all, Pucci! If you could design a space for anyone, what kind of space and for whom would it be? I’d love to build a luxurious modern beach house on an island for Justin Timberlake. I think he is so fun and would be an absolute kick to design for. Who wouldn’t want to spend time at the beach with Justin? Which design blog, website, TV show, or magazine would you be lost without? I am a big fan of 1stdibs and Remodelista. What do you love about Viyet? Viyet is a fabulous marketplace for designers and the general public to pick up high-end pieces at a great value. They do a terrific job curating the products so that quality is top notch. And there is such an amazing group of designers to pull from – it’s better than an auction house! Tineke Triggs founded Artistic Designs For Living (or ADL) over a decade ago after undertaking a huge project that became a major career change. She was in the midst of building her dream home in Wine Country and decided to leave a job in tech sales to pursue interior design - and we are so glad she did. Tineke has called color her muse, and when looking through examples of her work, you can tell how much she adores, and respects, the power of bright hues. She lets vibrant color be the star of the show, and supports hot pinks, fiery oranges, and lemon yellows with classic shapes and clean lines. 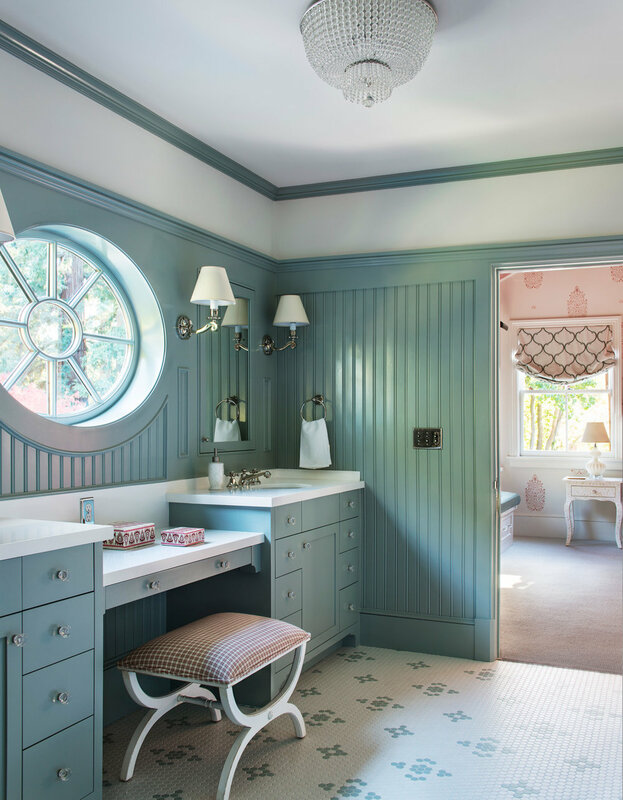 We appreciate how Tineke's designs are bright but never gaudy and are especially drawn to her bathroom designs. 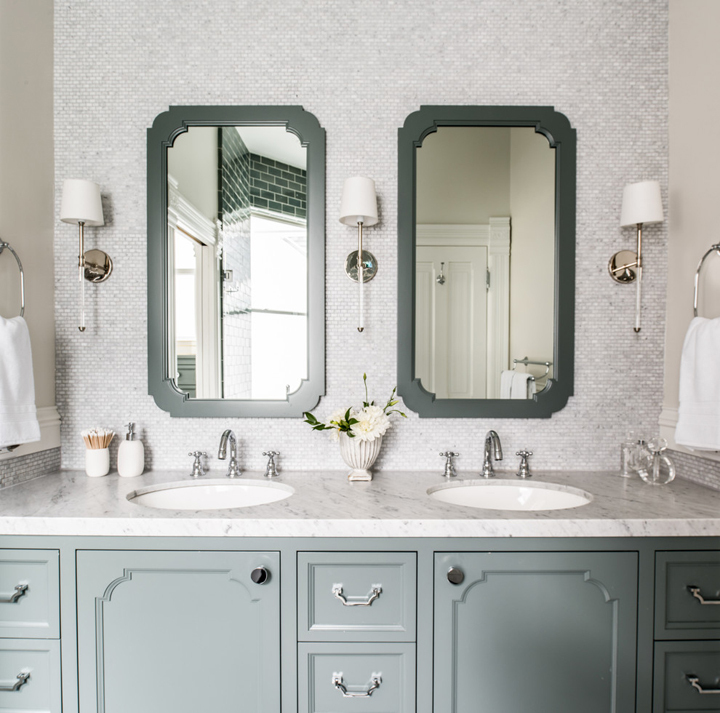 Whether vast white-on-white spaces or tiny jewel-box sized powder rooms, they all feel like works of art. Big thanks to Tineke for sharing her answers to our Designer Crush Q&A! 1. Where do you currently live in CA and what's special about how you've designed your personal space? I live in San Francisco. My personal space is like my personality - half Bohemian and half Ralph Lauren/Hermes. Growing up in Woodside, California, I'm a horse girl at heart but adore living in the city. In my own home I love pops of color and text with little elements of surprise and culture. My home has elements of my travels to Southeast Asia, and antiques from Europe and Africa too. 2. What's your dream design project? Who would it be for (dead or alive)? I'm dying to do a modern beach house overlooking Malibu, Santa Barbara, Bali, Mexico, or the Hamptons. Something, clean, fresh, and bright, but contemporary. Of course a project in Paris or London would be amazing too. 3. In real life, what's your favorite design project you've completed to date? This is hard. I have two favorites right now. One modern, rustic home in Tahoe with reclaimed ceilings, metal, and stone. 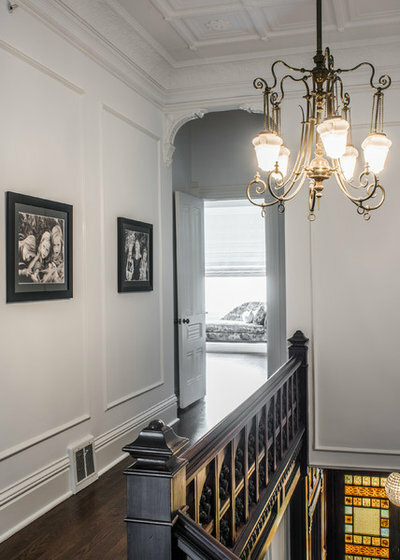 The other is a historic home in black-and-white with navy and orange accents, high ceilings, lots of light, and really cool intricate molding. The projects are very, very different from each other but extremely fun to work on with amazing clients. Both have elements of surprise that you wouldn't normally see in these types of homes - which is part of my signature look. 4. You've been gifted a fabulously furnished dream home but can only bring one item from your current space. What would it be? That is easy! My 6x5 foot photo of the wild horses of sable by Roberto Duesto. 5. What's your creative process when designing a space? Every time I start a project I imagine living in the space myself, then I pretend I am my client. How do they live and who are they? I think of what I can offer them that they wouldn't think of themselves. I think that is why I design a lot of my own furniture; I'm always coming up with things I want that I can't find...so I make it. 6. Where do you score prized interior design items? Any shopping tips? 1stdibs is one of the best places to shop for unique one of a kind items. My best tip is to pay attention to scale and color. No matter how much you like a piece, make sure it can fit and look good in your space. I can't tell you how many times I have seen a client purchase something they love but doesn't work in a room. It's such a waste! And if you are buying online, make sure you know the quality of the company you are buying from and the return policies. 7. Ever had an epic DIY disaster? What project would you never take on again yourself? Of course- you can't be in the business this long and not have a couple great war stories. But I think my worst is when I first got started and I thought I could be a general contractor and hang crown molding myself. It looks so easy when you see them do it on TV! It was a disaster. I have such respect for my contractors and craftsman - I will never do that again. 8. 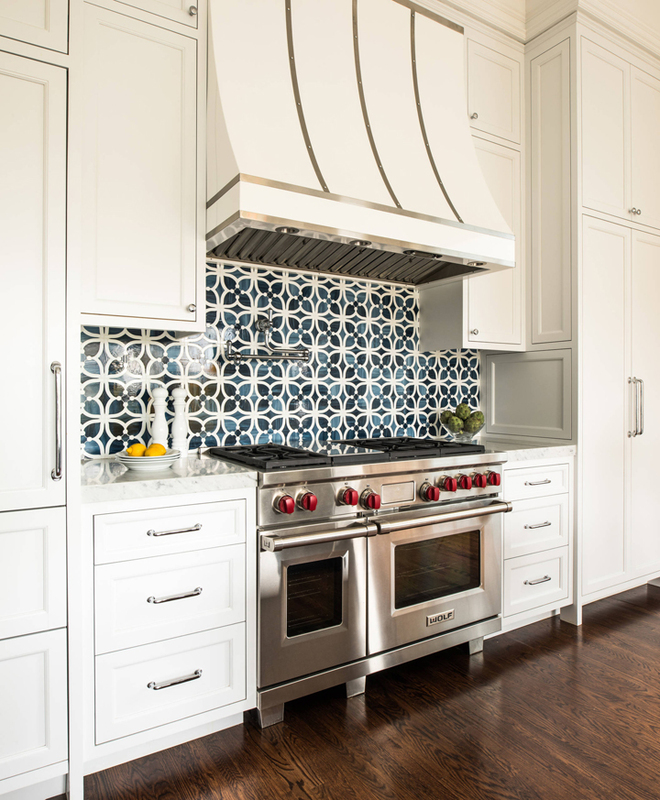 What new design trend are you excited to integrate into your next project? My new thing is custom hardware, including fun cabinet pulls I designed myself and some unique one-of-a-kind objects that I turned into pulls for furniture and cabinetry. It really makes furniture stand out! Should you spend money on a fabulous bathroom or kitchen? Depends on if you love entertaining and cooking more then spas and tubs. I'm a spa girl and my husband is a book cook. He would say kitchen and I would say bath! Would you rather shop new or vintage? Great view or perfect pool? 10. What's one tip you wish someone had told you when first starting out in the design world? Understand budgeting and learn how to use a spreadsheet. Design and budgeting go hand in hand. They don't teach that in school and they really should! Name: Tineke Triggs of Artistic Designs for Living Location: San Francisco, CA Tineke Triggs of San Francisco's Artistic Designs for Living office illustrate one's computer may look like everyone else's, but your workspace certainly does not have to abide to conventions, especially when it comes to color. A bold and fashionable palette of magenta and vibrant yellow permeate into textural patterns on upholstery, flooring, and wallpaper, neutralizing the otherwise mundane PC and wired phone elements into the background. 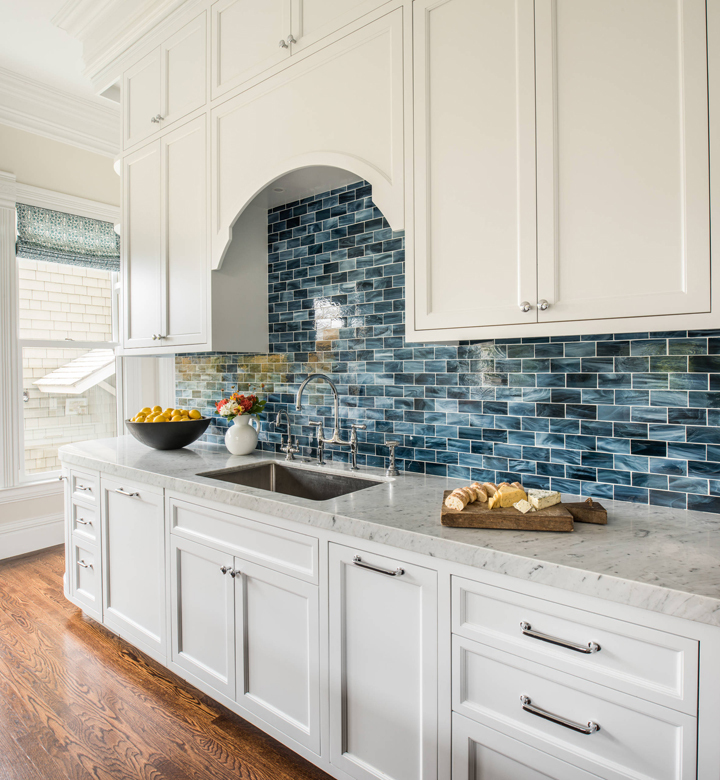 In today’s kitchens, countertops are much more than just a work surface, serving as an integral part of the design, and often as a focal point for the space. The growing number of countertop materials offered by manufacturers makes it easier, and in many cases more fun, to design with countertops that command attention. Consider the opportunities provided with materials that range from natural stone and quartz, solid surface and wood to glass, metal, recycled materials and more. Add a bit of creativity with interesting angles, mixed materials and LED lighting and every client can have a unique statement piece designed specifically for them. To achieve that goal, she created a cohesive color palette in grey that includes the Jerusalem Grey limestone countertops as well as the raised metal island top that is highlighted with industrial rivets that mirror those used in the bar stools and complement the massive custom range hood sculpted from cold-pressed steel. 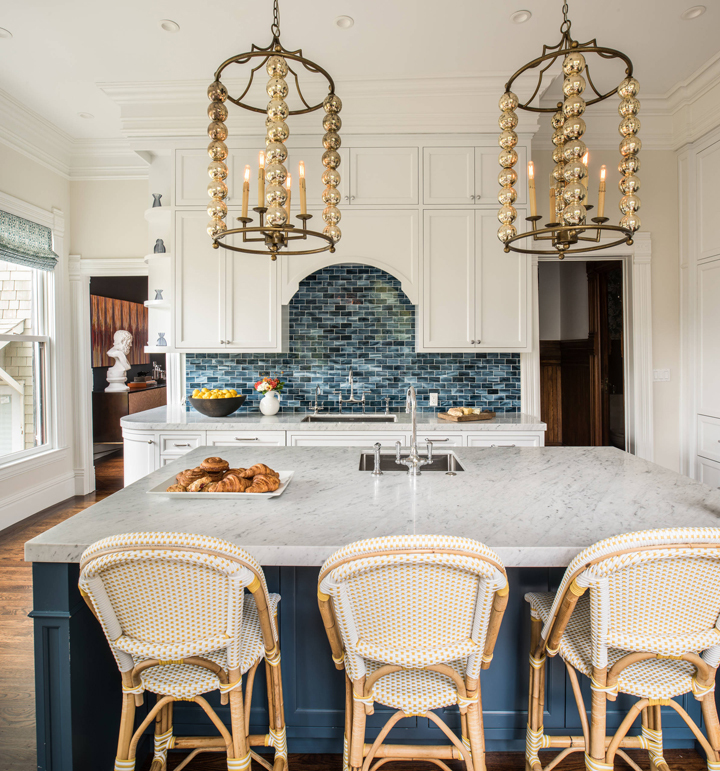 The open kitchen also features salvaged materials, including pendant chandeliers made from baskets designed to catch minnows. The thing about decorating a Lake Tahoe Getaway is that you’re pretty much indebted to the dramatic High Sierra terrain, and therefore obligated to pay homage to its grandeur in your design. But if you aren’t careful, all that timber and leather and plaid—the de rigueur riggings of mountain living—can start to feel just a little tired, despite their inherent “warmth.” Chances are good, after all, that your neighbors have adopted the same aesthetic. How, then, can you infuse some modernity and imagination into such an archetypal style? If you’re interior designer Tineke Triggs, who recently created a High Sierra escape near Homewood Mountain Resort on the west shore of Lake Tahoe for a young family of four, you do the following: 1) Scour the property for relics of ski seasons past for possible design fodder; 2) freshen up quintessential embellishments of mountain décor with wittier versions; 3) bring in unexpected texture to liven up the neutral palette that rustic environments demand; and 4) accomplish all of the above while maintaining a sense of authenticity. As you might expect, timber is well represented in the 4,000-square-foot house, imparting its warmth and rusticity in nearly every space. But even this traditional material reveals itself in unorthodox ways: In the master bathroom, for example, the ceramic floor tiles, arranged in a classic herringbone pattern, realistically mimic wood grain. 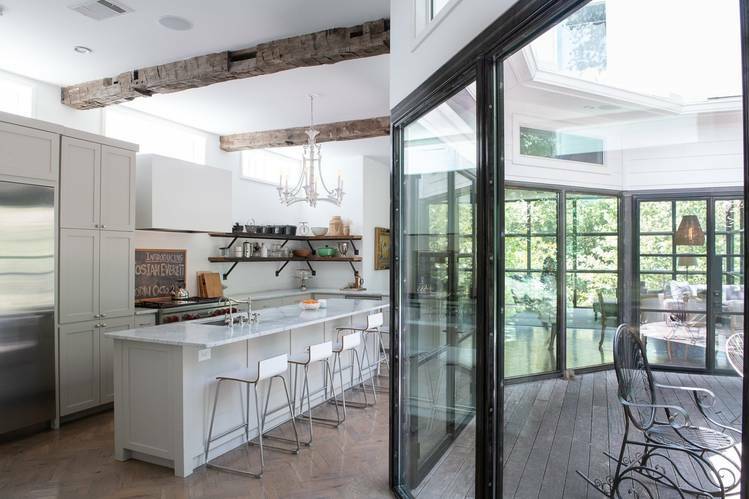 And reclaimed barnwood isn’t used on the floors, but overhead—a trick Triggs used to draw attention to, not away from, the low ceilings in some parts of the house. “When there was nothing I could do to make them taller, I opted to make them interesting,” she says. While California poppy-inspired orange-red pillows, throw blankets and artwork enliven the neutral color palette, Triggs also relied on texture to provide interest. The walls of the powder room, for example, appear to be covered in black horsehair, but it’s really vinyl wallpaper. Old minnow baskets lined with crisp linen were repurposed for light fixtures in the kitchen. And two club chairs in the living room are upholstered in sumptuous, oh-so-fluffy shearling. “Sinking into them feels like I’m slipping into a pair of warm Ugg boots,” Triggs says. While the surprising design elements give this residence its personality, it’s the designer’s attention to coziness that provides its soul. After all, comfort is often directly proportional to that unmistakable feeling of home. Rustic rooms can sometimes feel a bit heavy. Interior designer Tineke Triggs gives us her tips on how to lighten the mood. Swapping out heavy fur and velvet throw pillows and blankets for lighter fabrics is an easy and inexpensive way of changing the look and feel of a room. Warm autumnal colors seem like a given for a mountain home, but don’t be afraid to go bolder by incorporating hints of saturated color. Heavy window treatments made from velvets and mohair might not be the best match for a rustic room. Try Roman shades or even a lightweight plaid—they can feel traditional without being stuffy. Art can soften or energize the mood of a room. Work with an art consultant. It can save you time and money. Rustic environments often have rich wood flooring. Be expressive by choosing rugs with a variety of colors and textures. For example, don’t be afraid to mix a Moroccan rug with a hair-on-hide covering. Choosing a few whimsical statement pieces, like the old ski-patrol-toboggan-turned-chandelier suspended over the dining table, is much more interesting than an off-the-showroom-floor light fixture. Designer Tineke Triggs made the most of an unusually spacious kitchen in her client’s Edwardian flat. Whether used as a prep station or a breakfast bar, the streamlined metal table is less bulky than a solid island and offers the same amount of counter space. Triggs started by switching out the room’s tiny window for a taller one, and then opening up the doorway to the dining area to bring in some of the kitchen’s new light. An original Thiebaud painting would have blown the $75,000 budget, so Triggs had the postcard’s image enlarged instead. 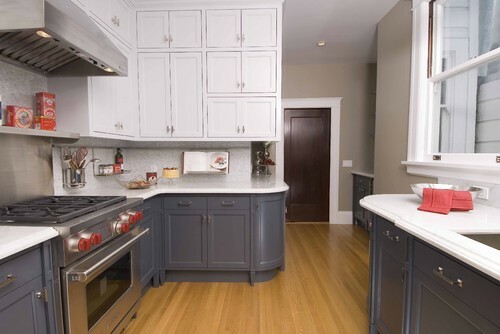 Frosting-white paint was chosen for the cabinets, while the gray-blue background of the painting is mirrored in the kitchen’s subway tile backsplash. The palette was inspired by the adjacent dining area and Wayne Thiebaud’s Cakes painting. To keep the room open and fresh, a clunky island was nixed for a slim stainless steel table on casters that doubles as a casual dining spot. An antique armchair scored on eBay got a fresh coat of paint and new upholstery to fit the palette. The round shape of the cakes in the inspiration artwork is echoed in the arches above the sink and the curves of the chandelier. 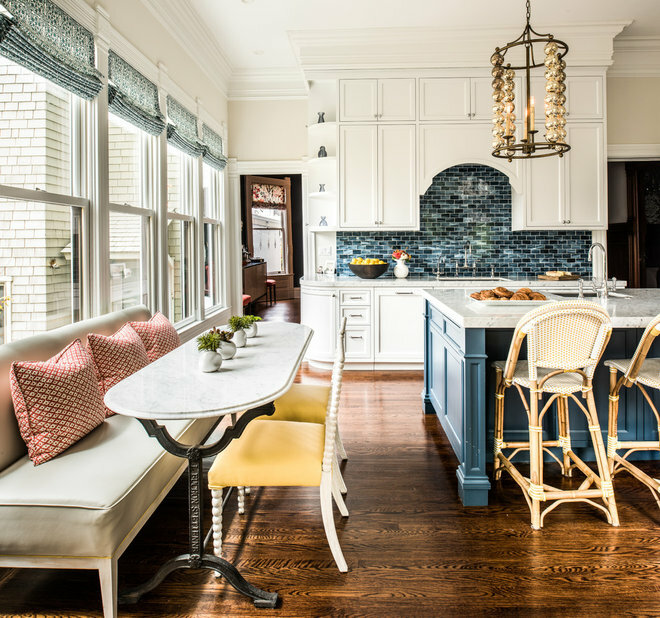 Yellow accents dot both the kitchen and dining areas like icing. The finished product was just what the client, a single woman who works in public relations, had hoped for. “Kitchens tend to be very masculine,” Triggs says. “Being able to tweak that and create a room that’s feminine and glam was a lot of fun.” Sounds like sweet success. Copyright ©2019 Artistic Designs For Living. All rights reserved. Hello friends, we are using some basic cookies to give you the best experience on our website. We also use Pinterest to allow users to pin to their Pinterest accounts.